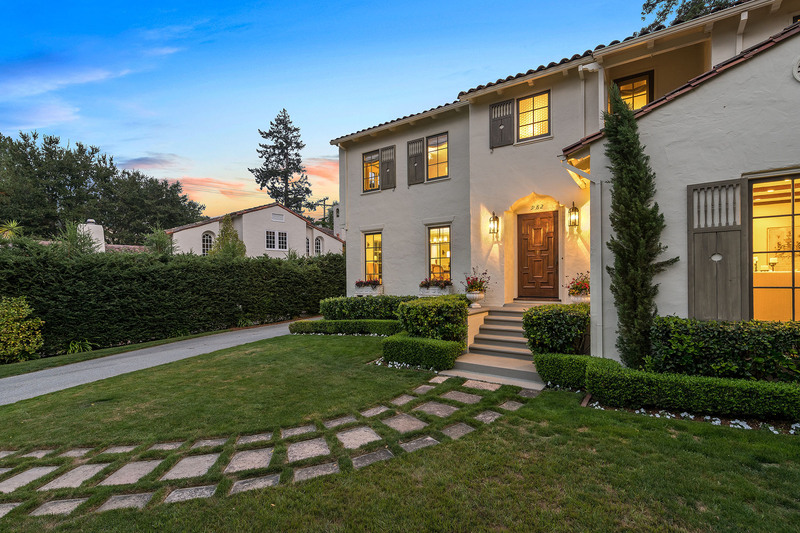 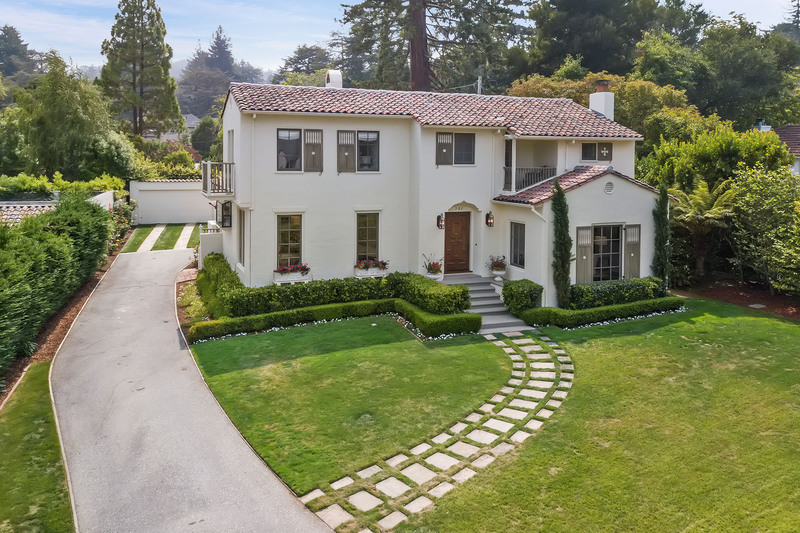 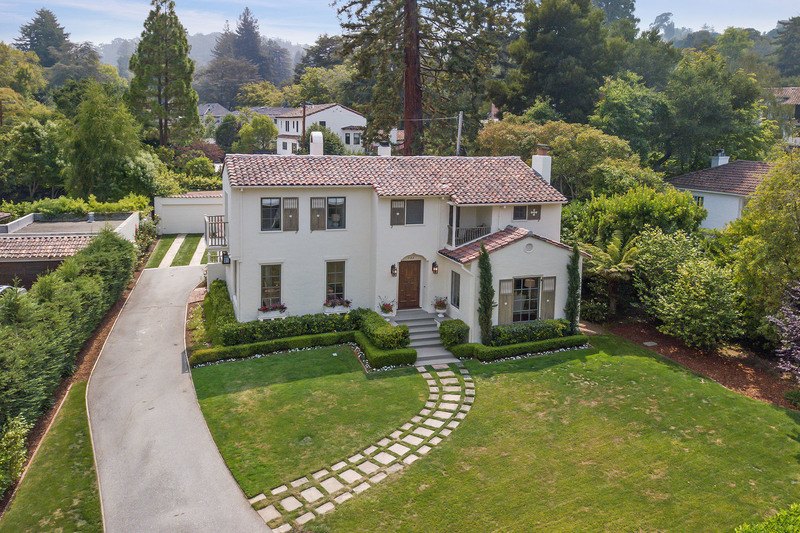 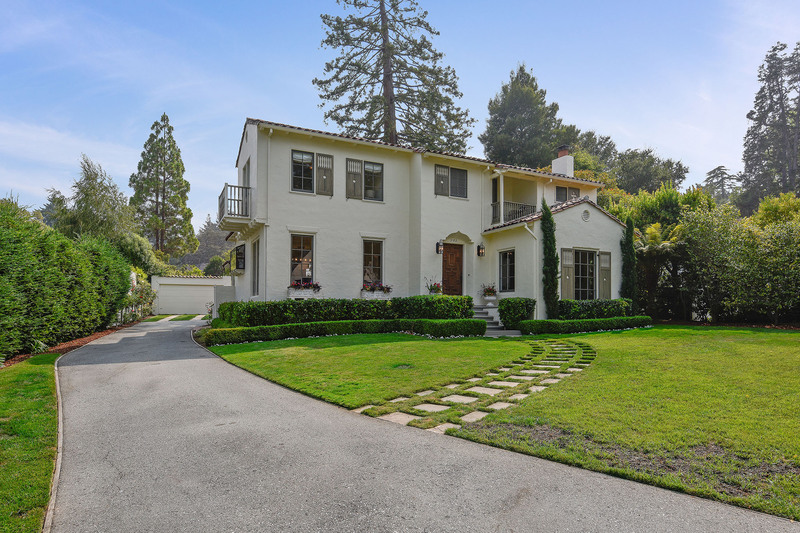 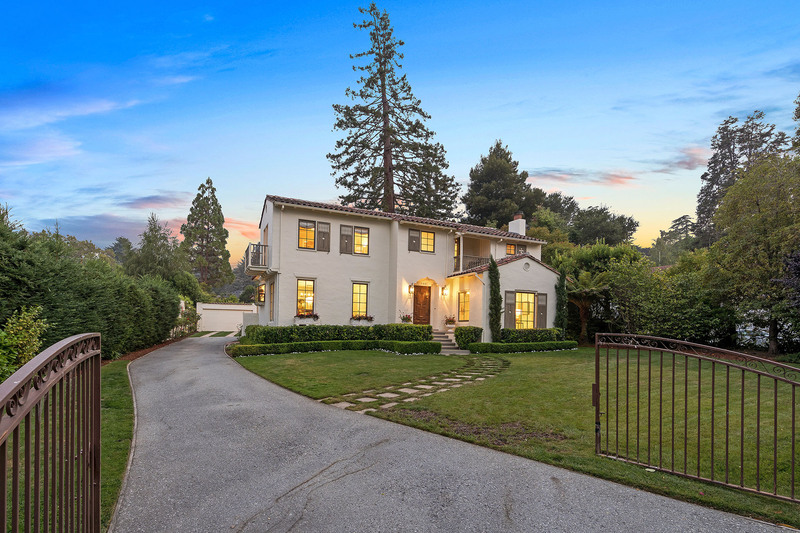 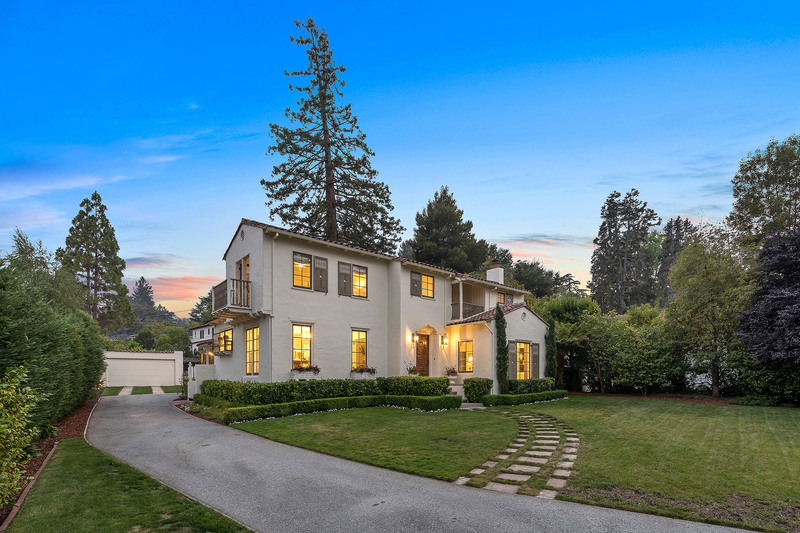 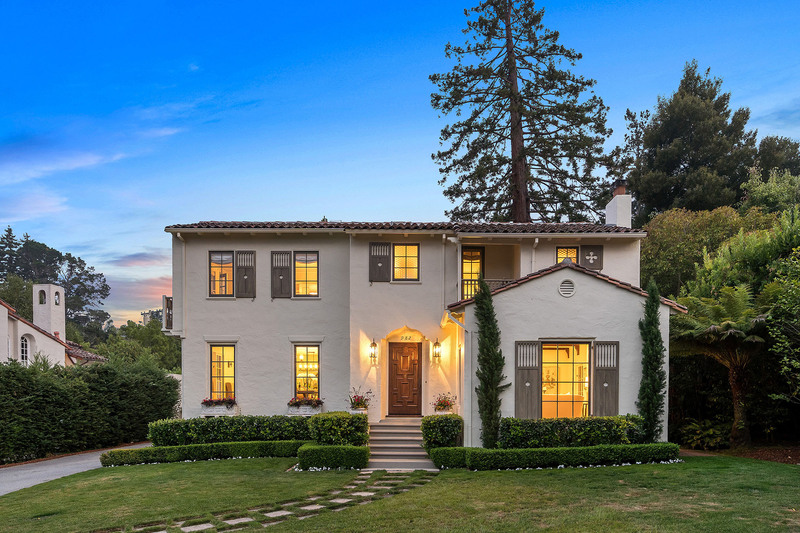 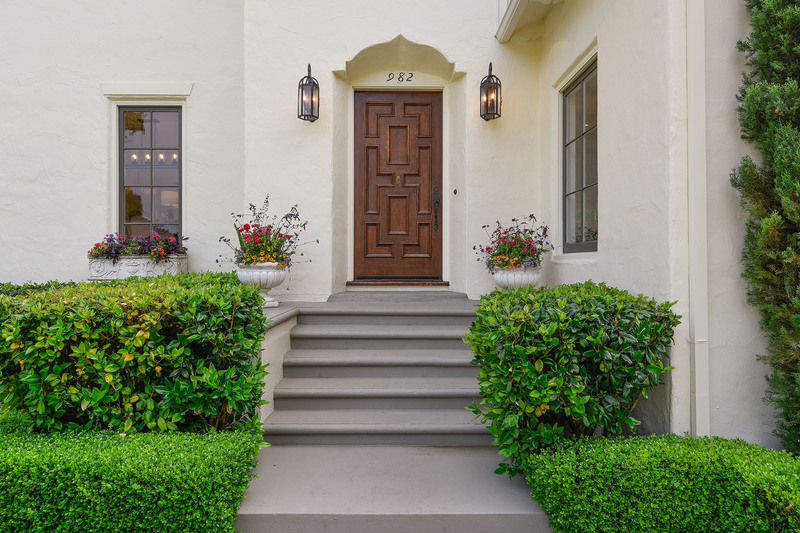 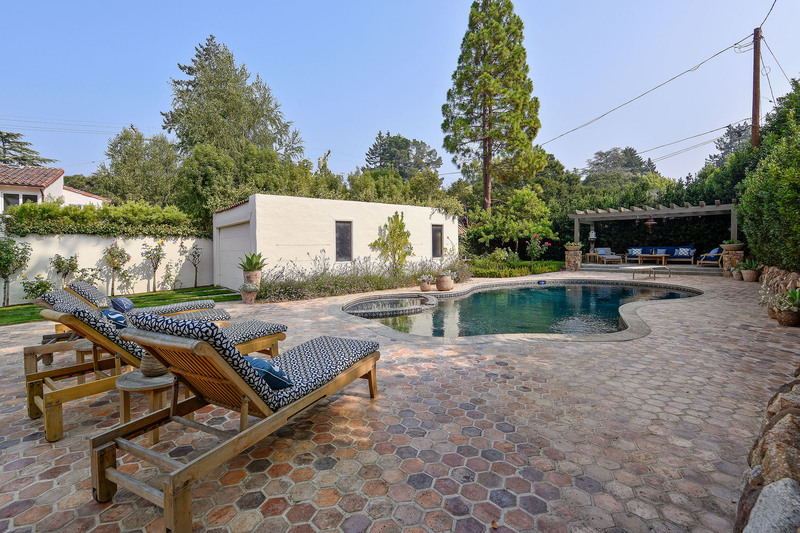 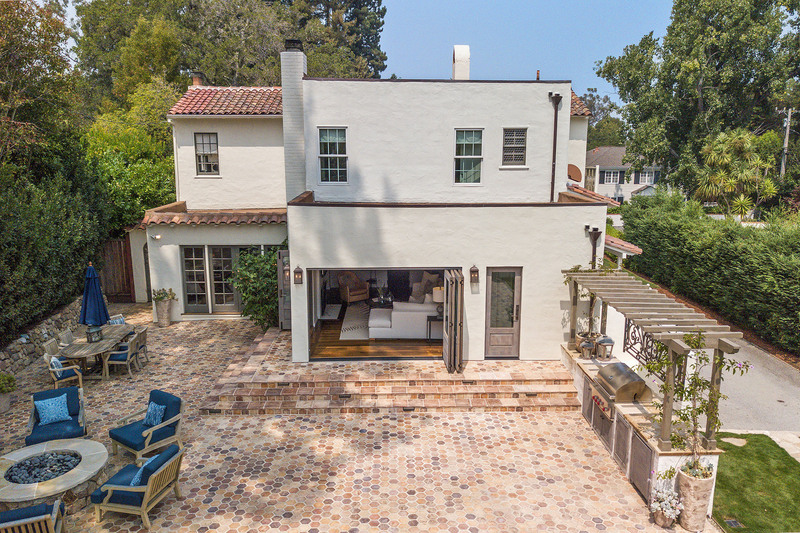 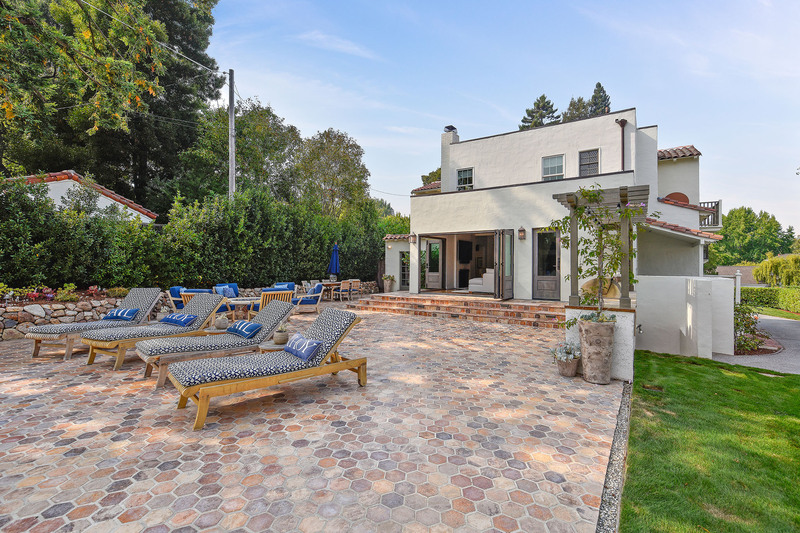 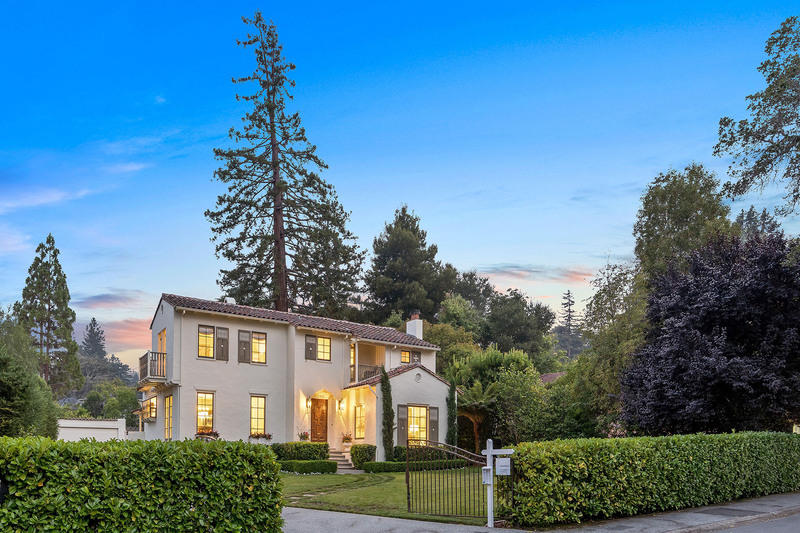 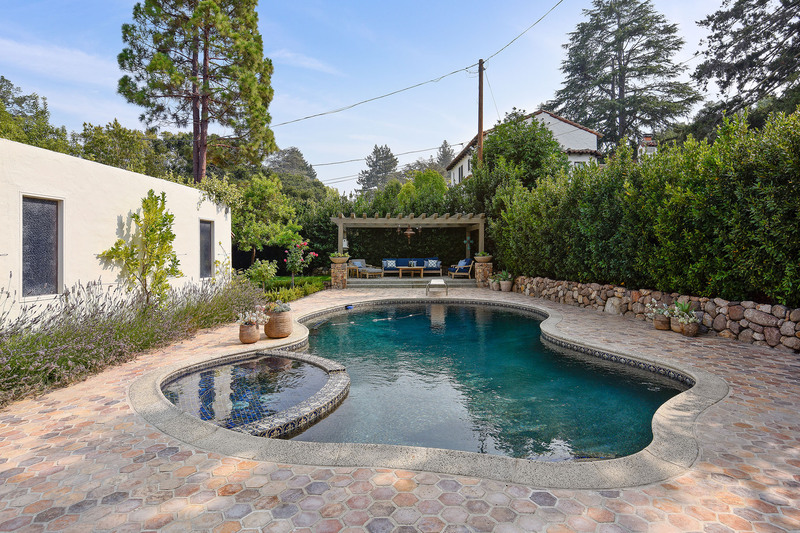 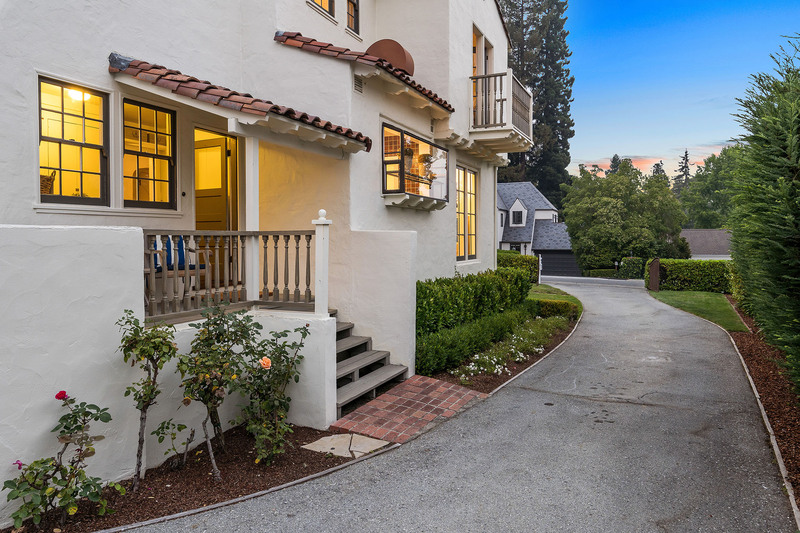 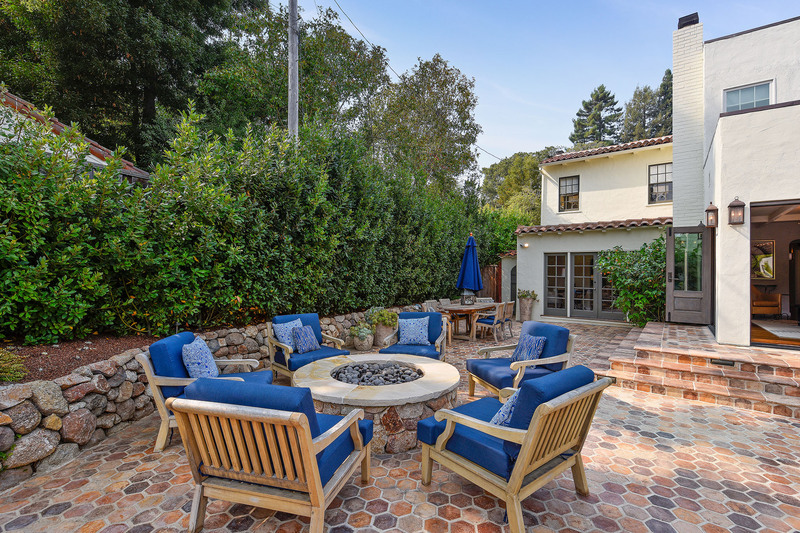 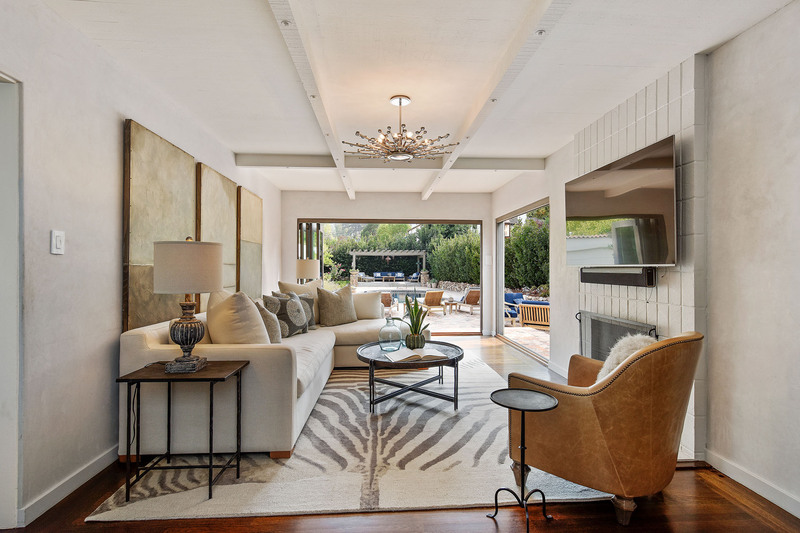 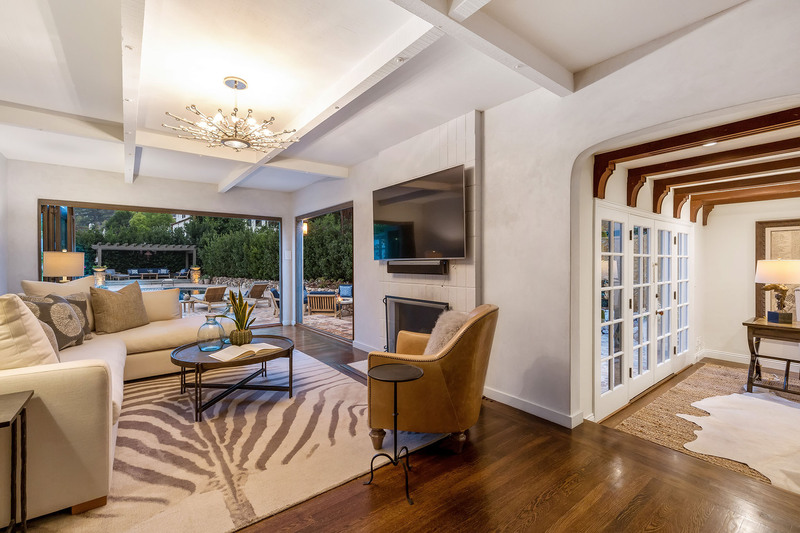 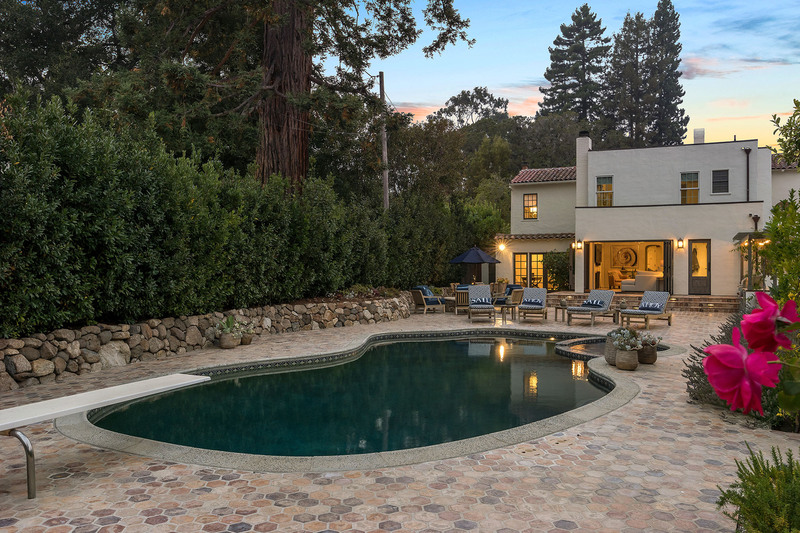 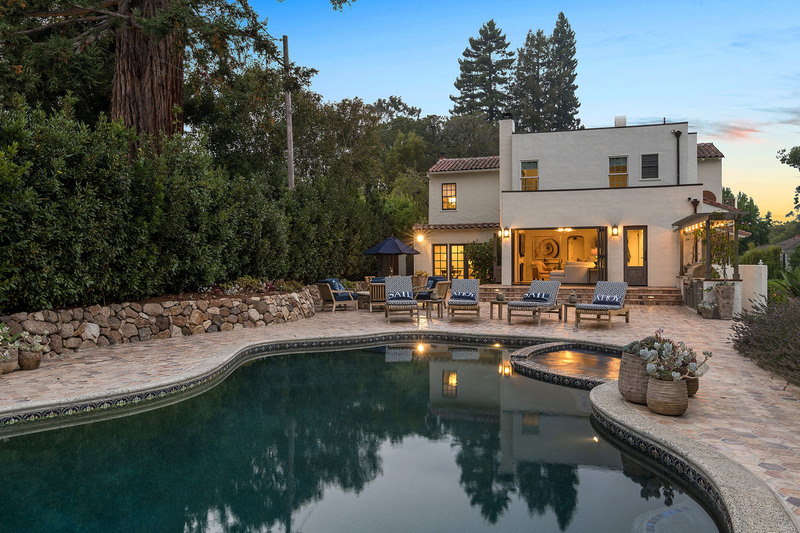 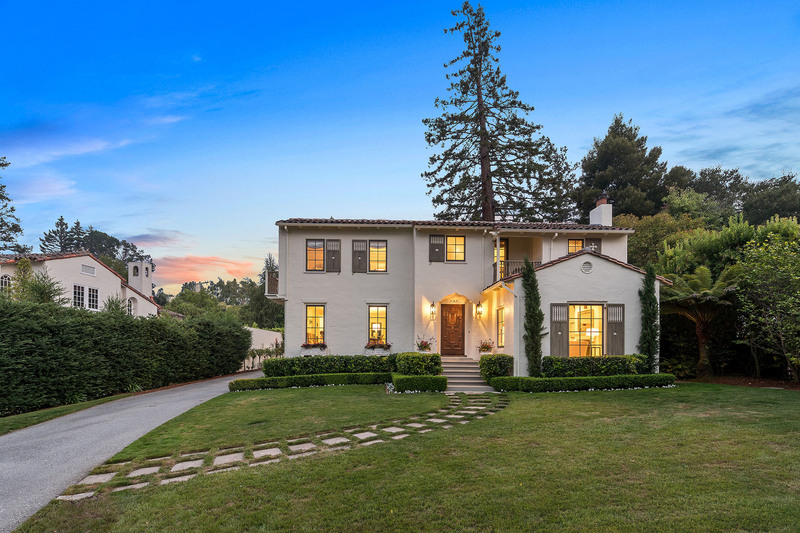 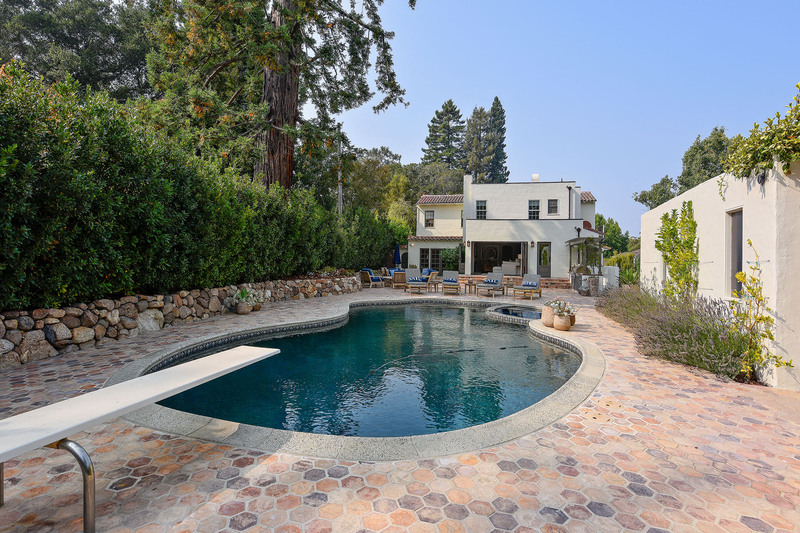 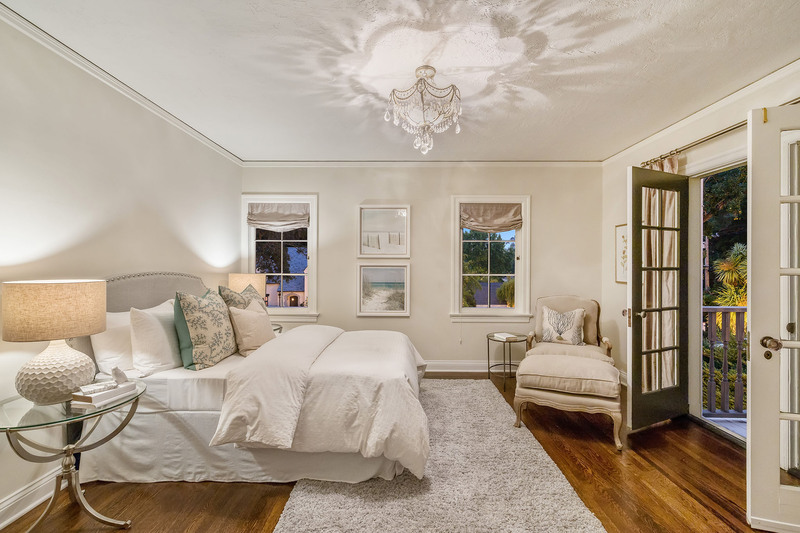 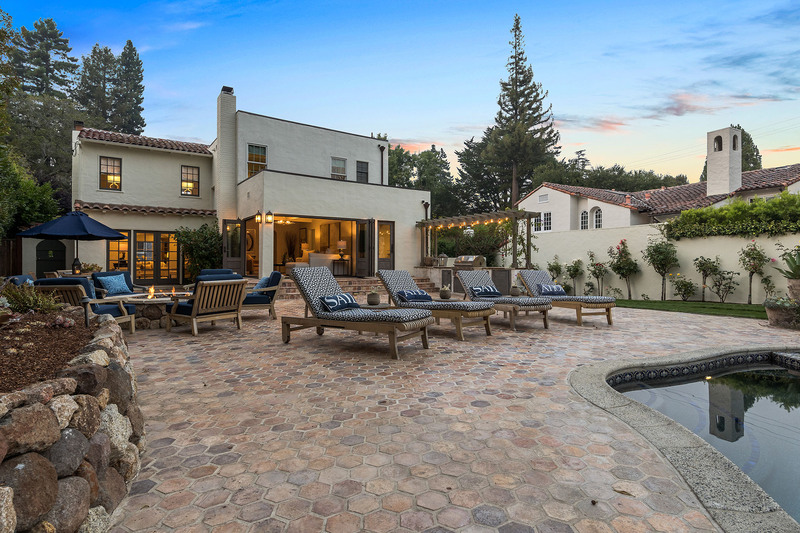 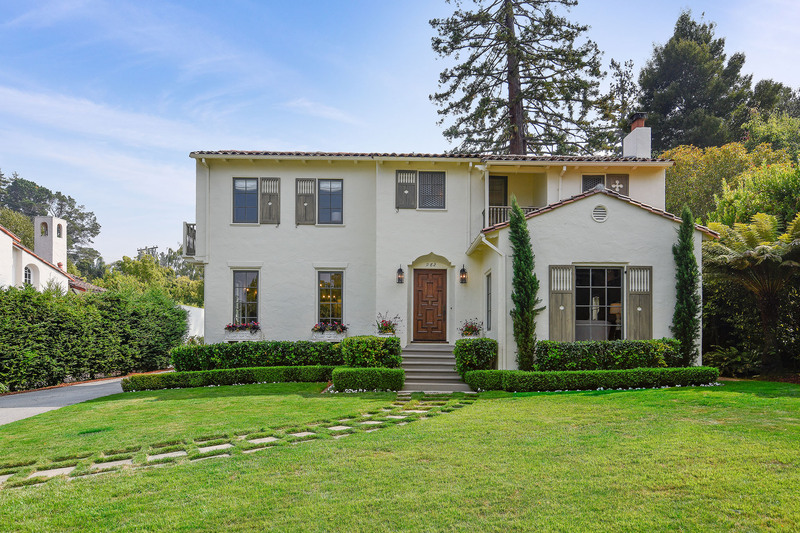 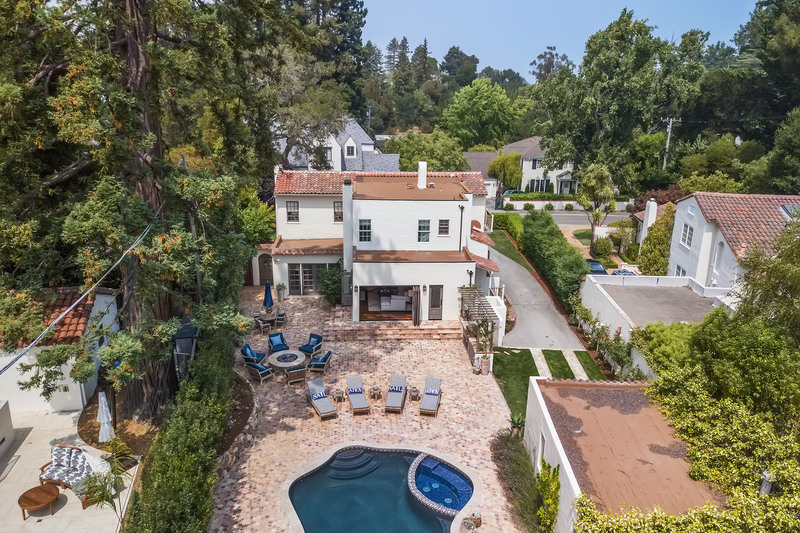 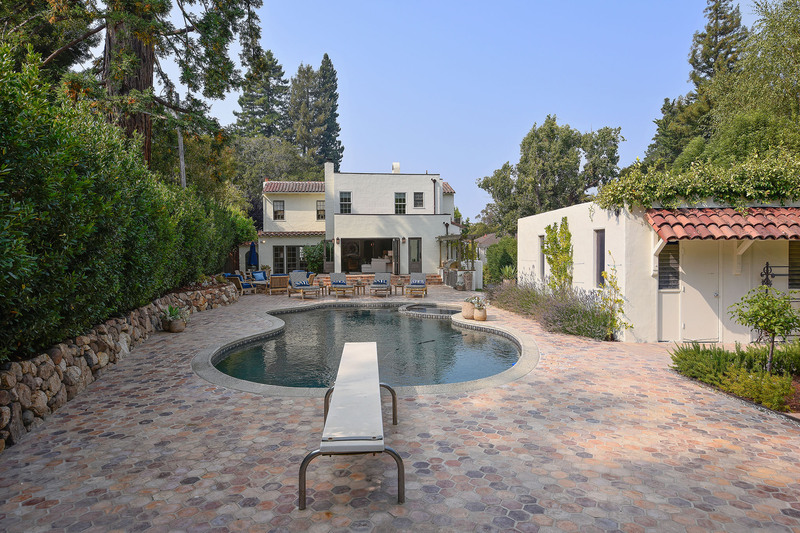 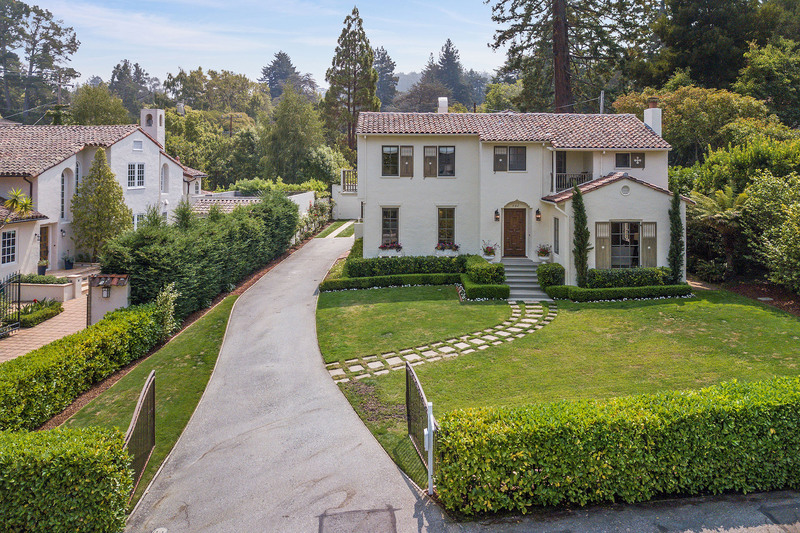 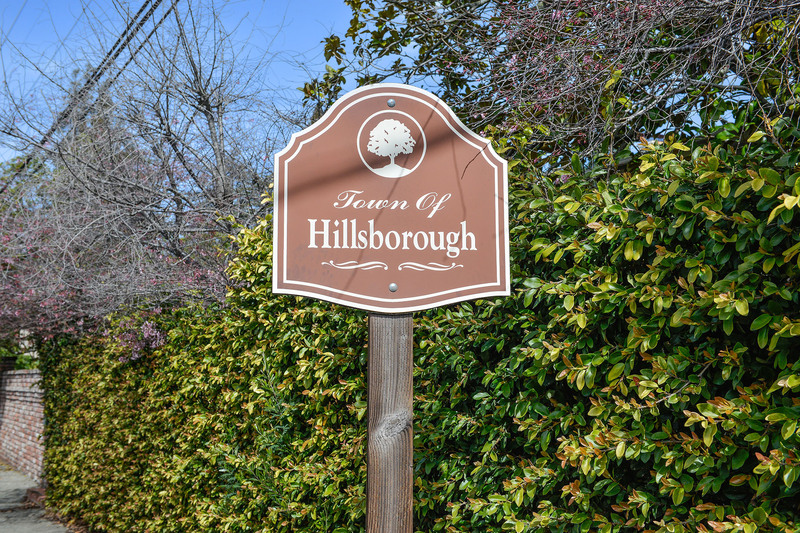 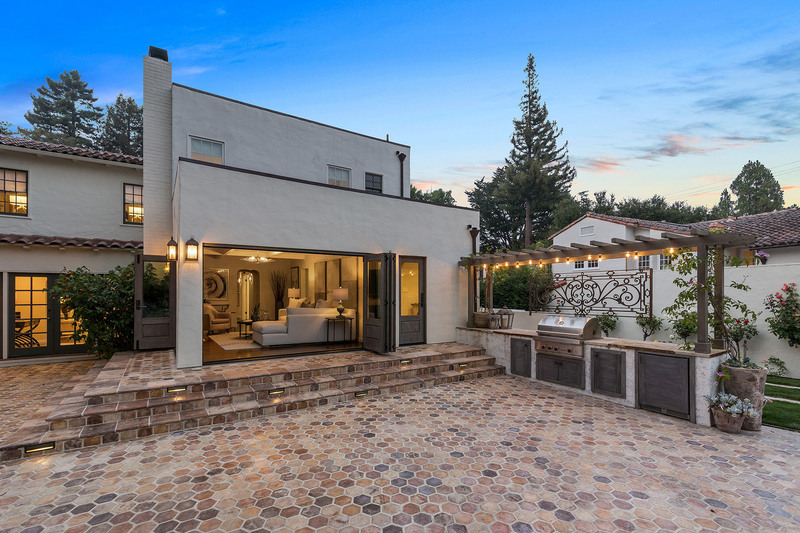 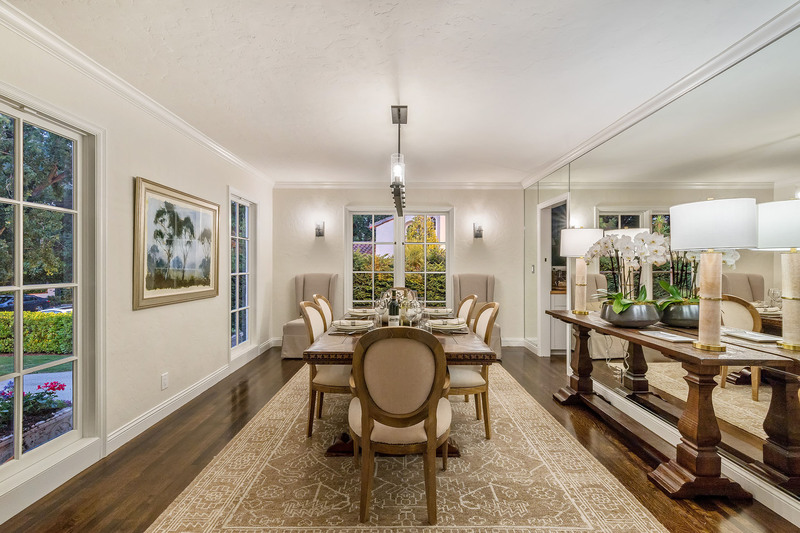 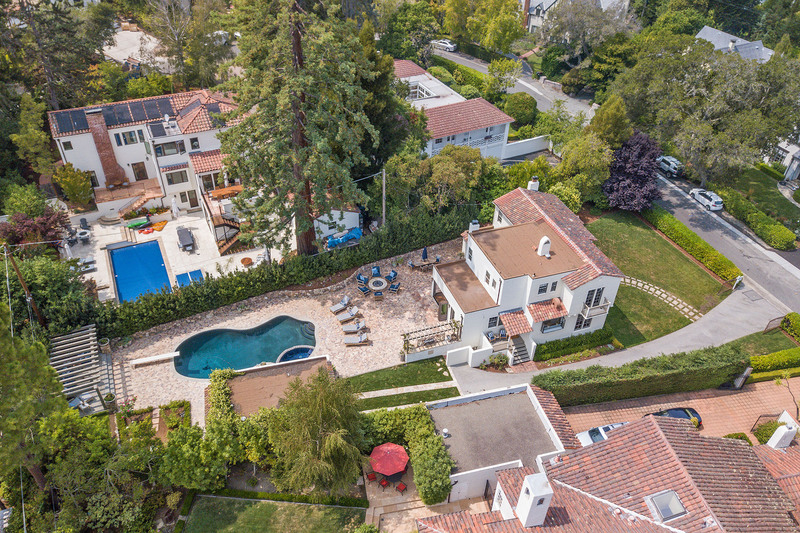 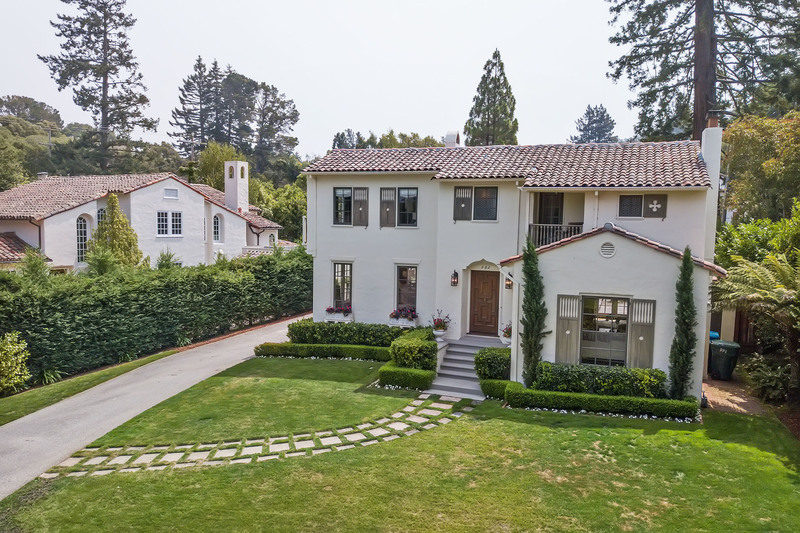 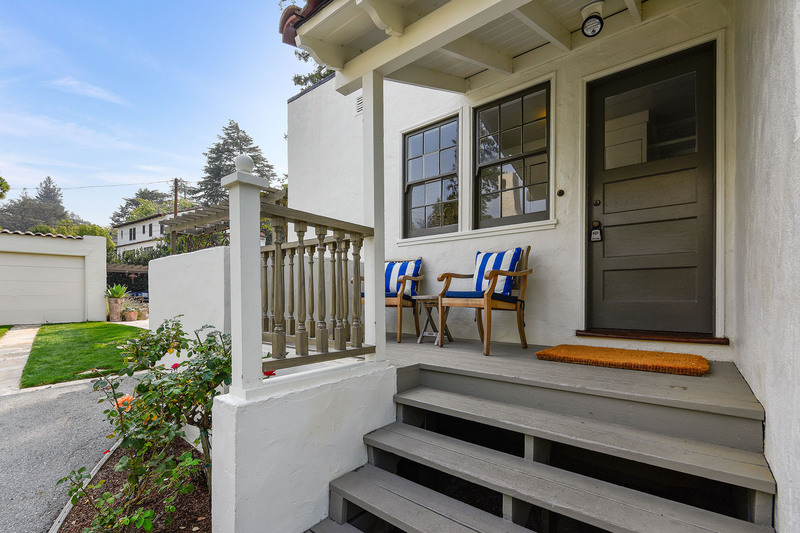 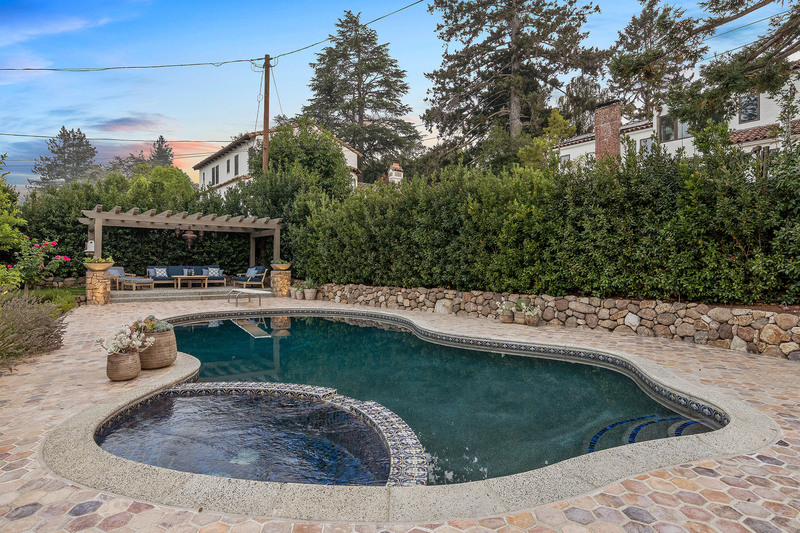 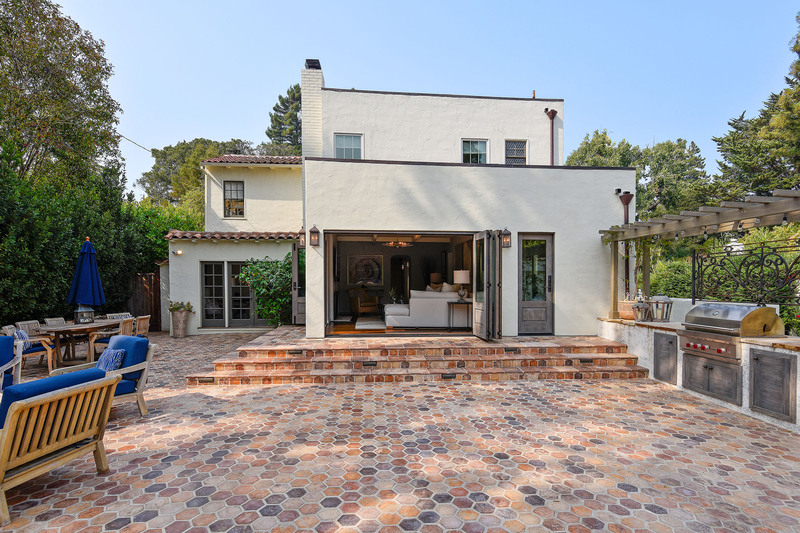 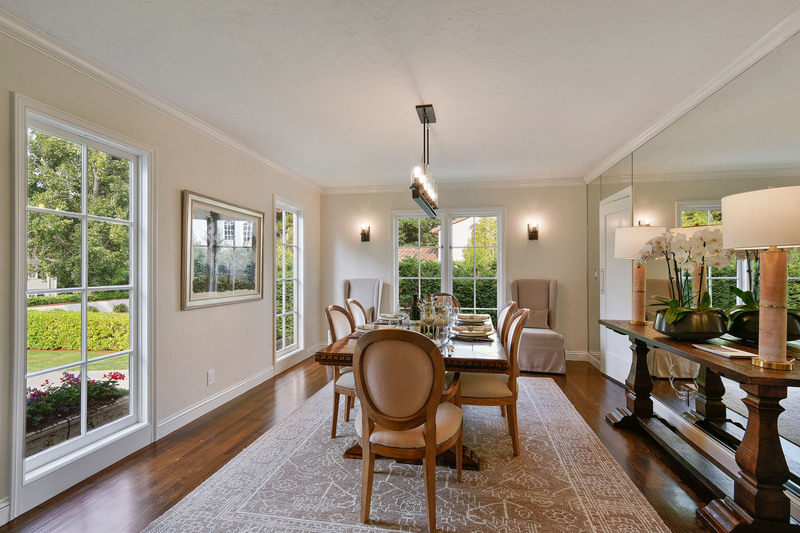 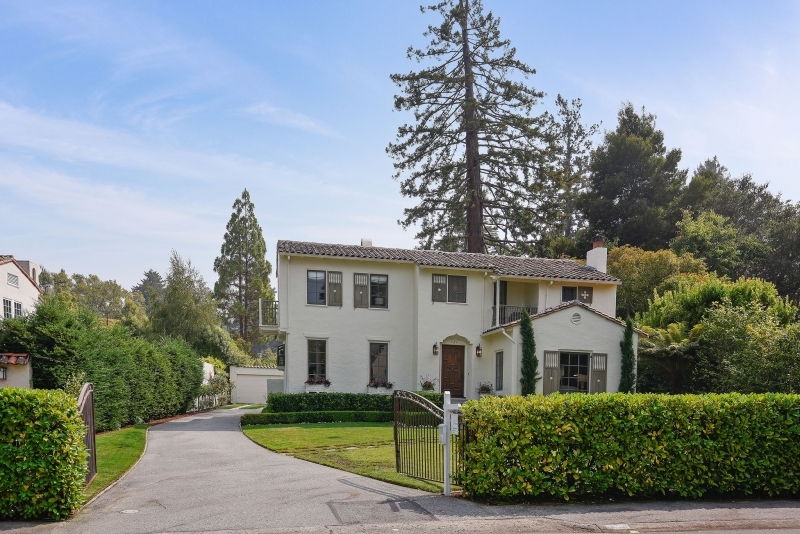 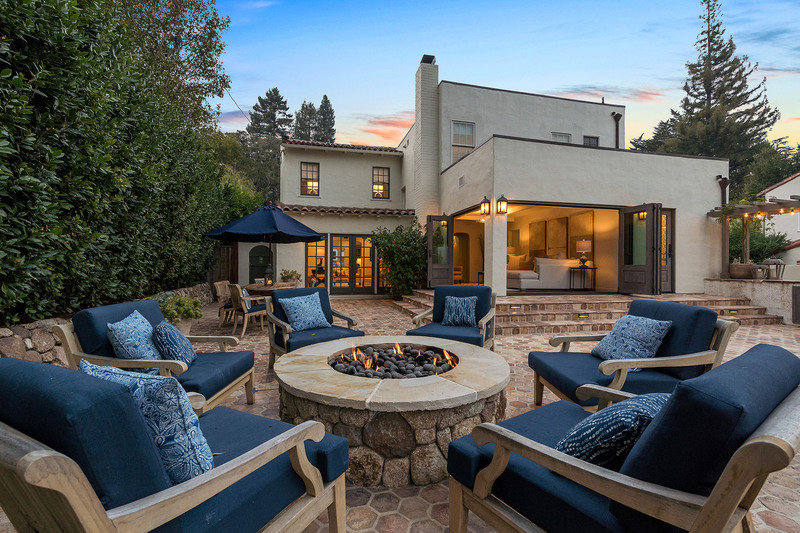 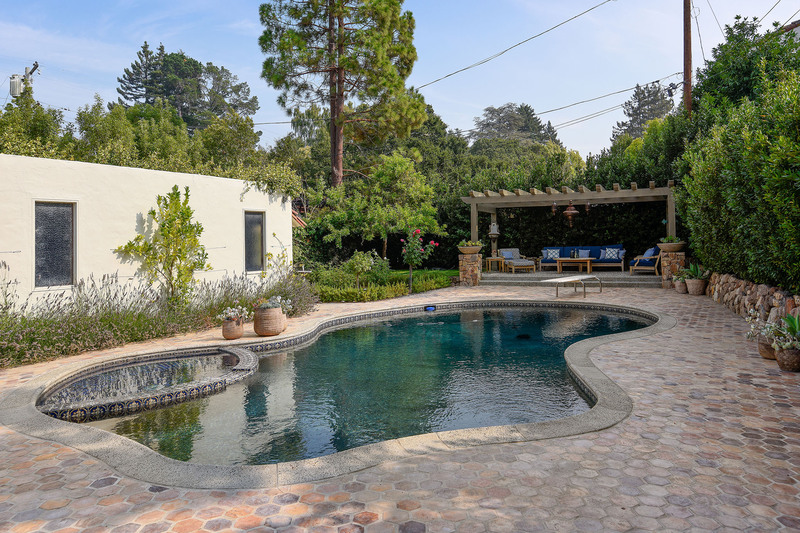 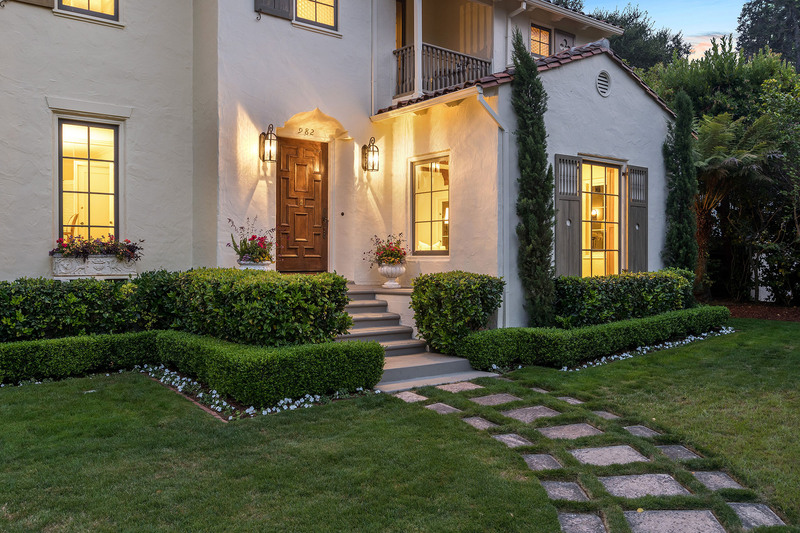 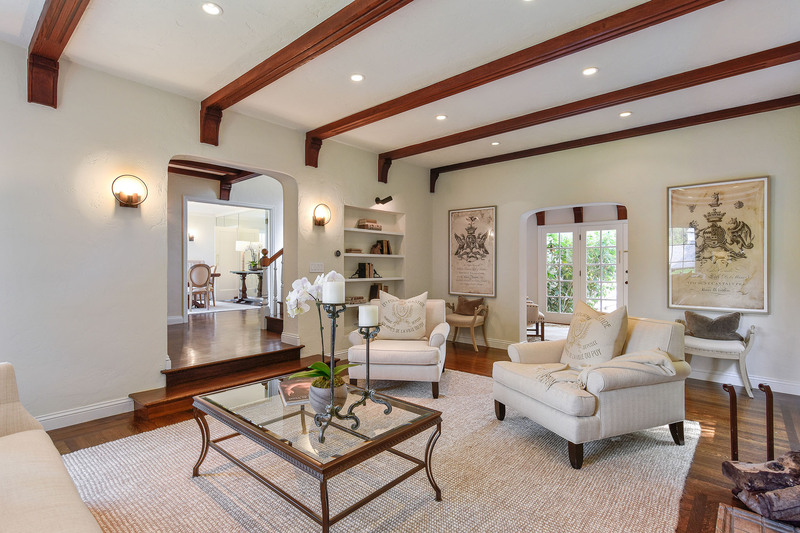 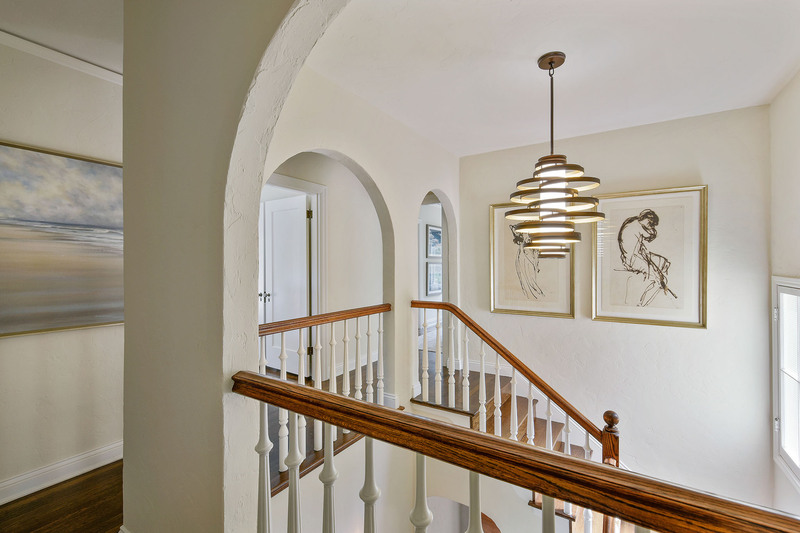 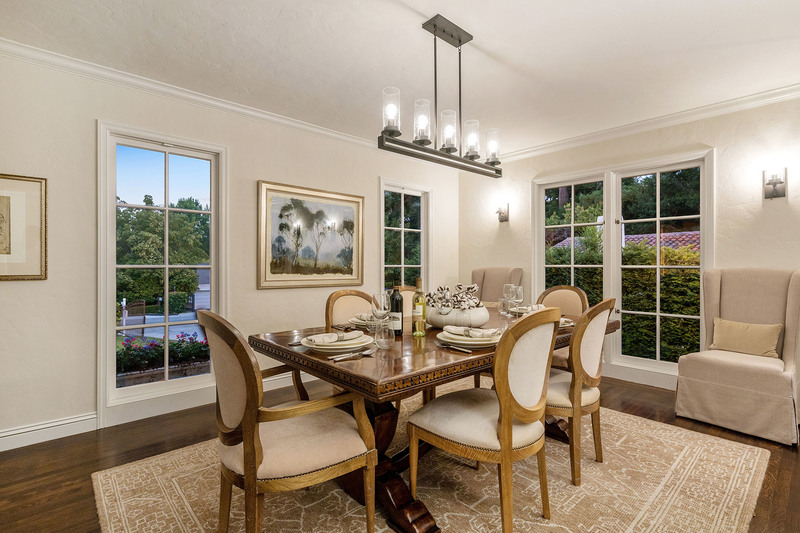 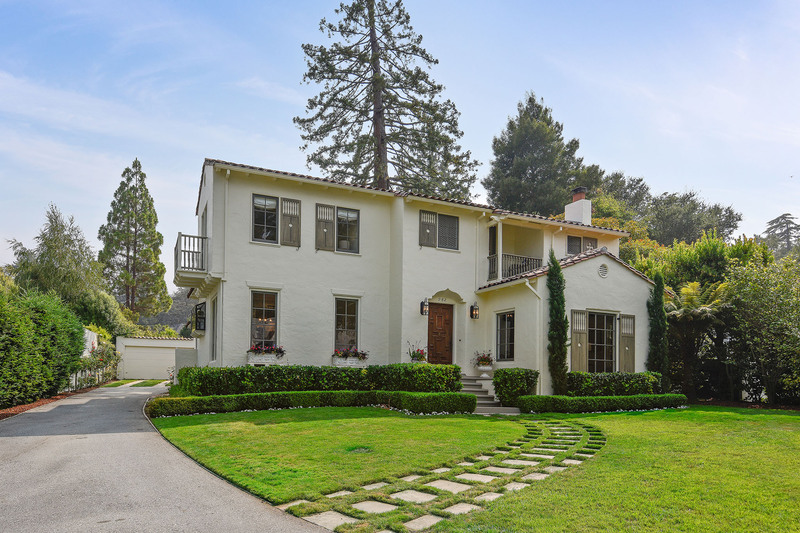 Located on one of Hillsborough’s most favored streets, among other distinctive homes, this circa 1928 Spanish Colonial home has retained its architectural integrity and offers a timeless ease and fluidity between formal and casual living areas and the out of doors. 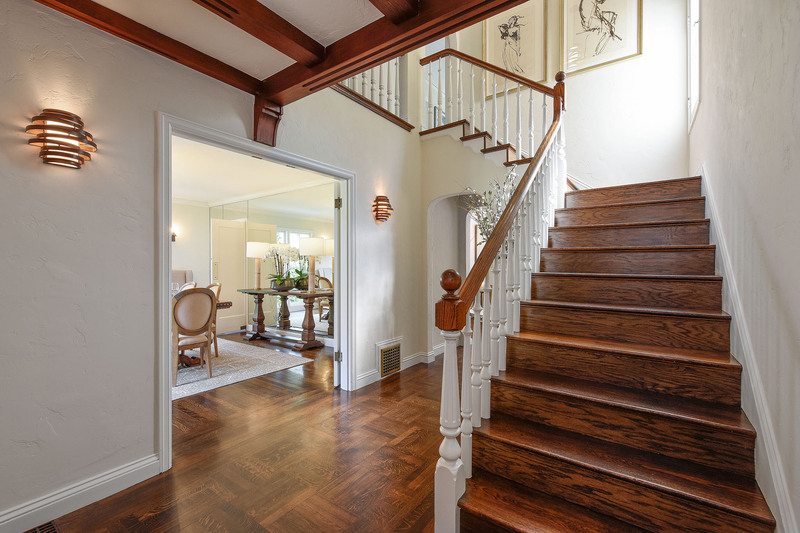 An open 2-story foyer with staircase connects the two levels with the hallway above. 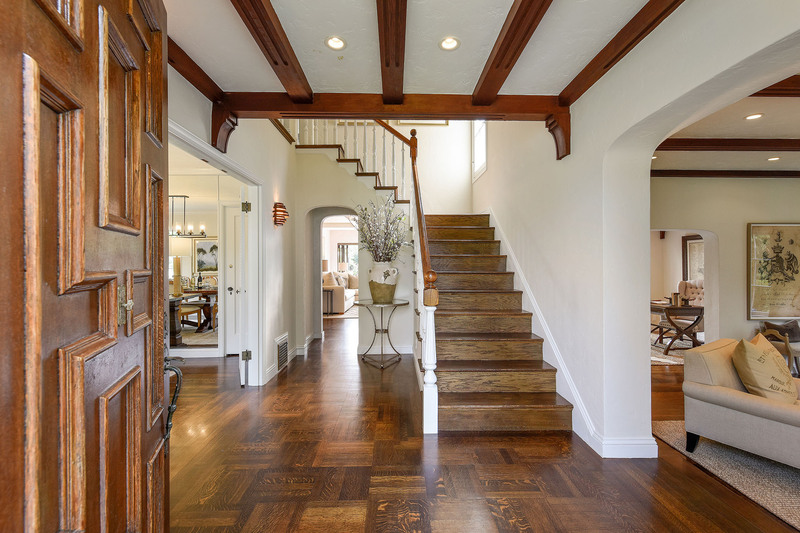 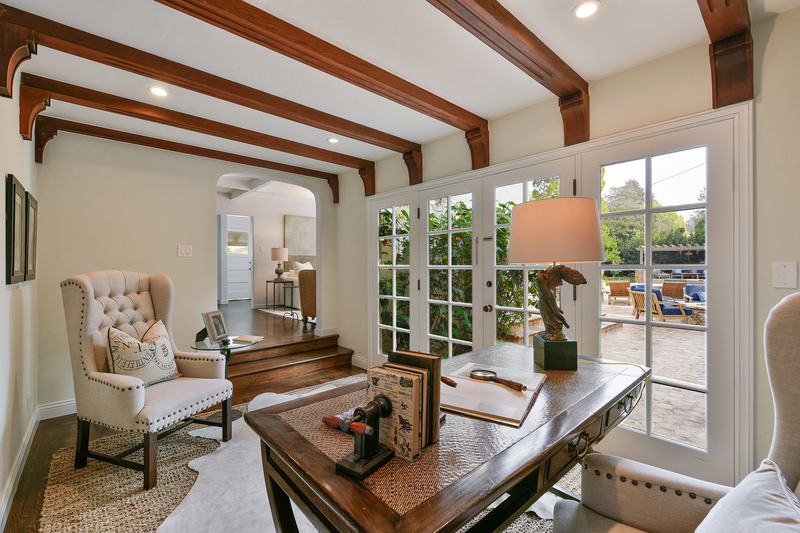 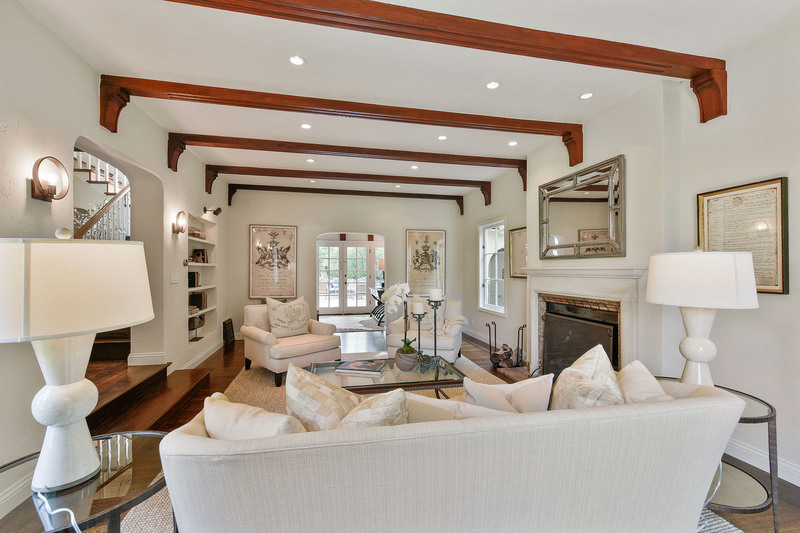 To the right of the entry is the living room, a gracious welcoming space with wood ceiling beams, large windows, hardwood floors, built in bookcase and a fireplace. 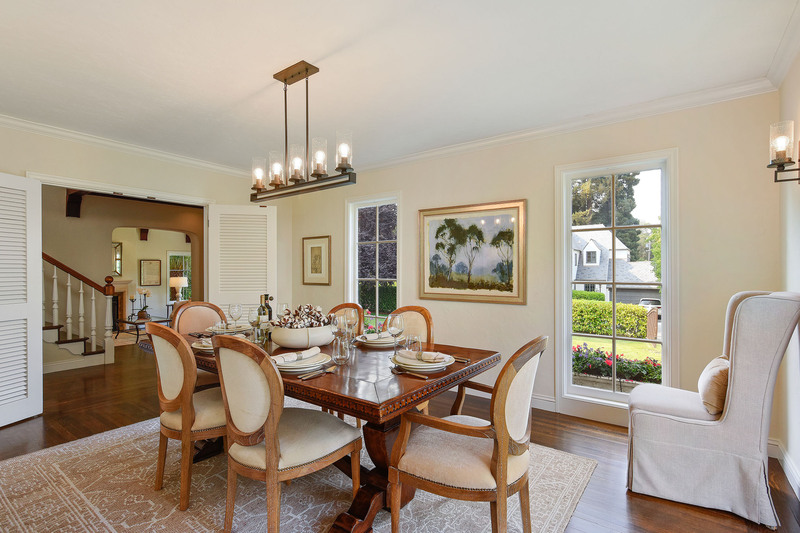 Across from the living room is the formal dining room. 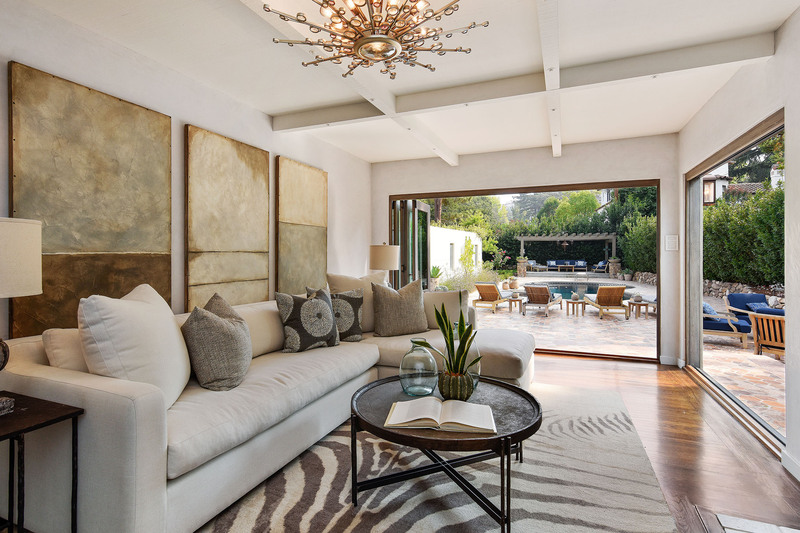 Generous natural light and front garden views are enhanced by a mirrored wall that expands the space. 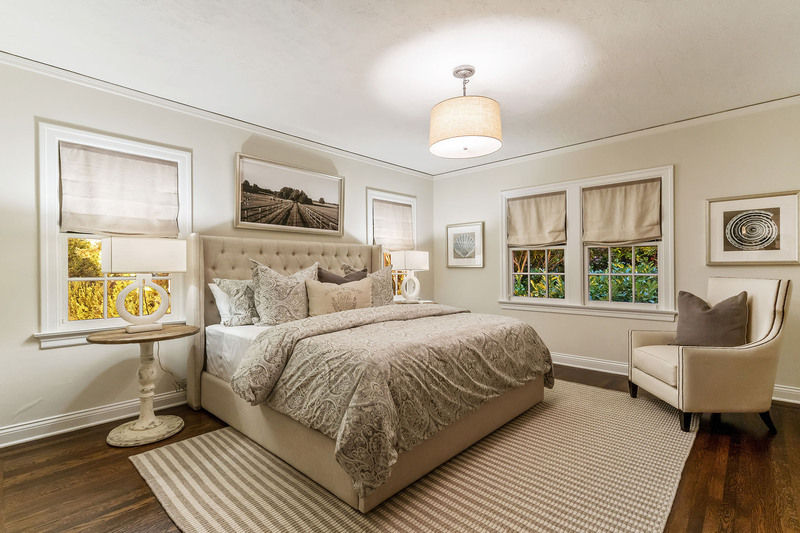 A very generous closet provides storage of linens, china or decorative items. 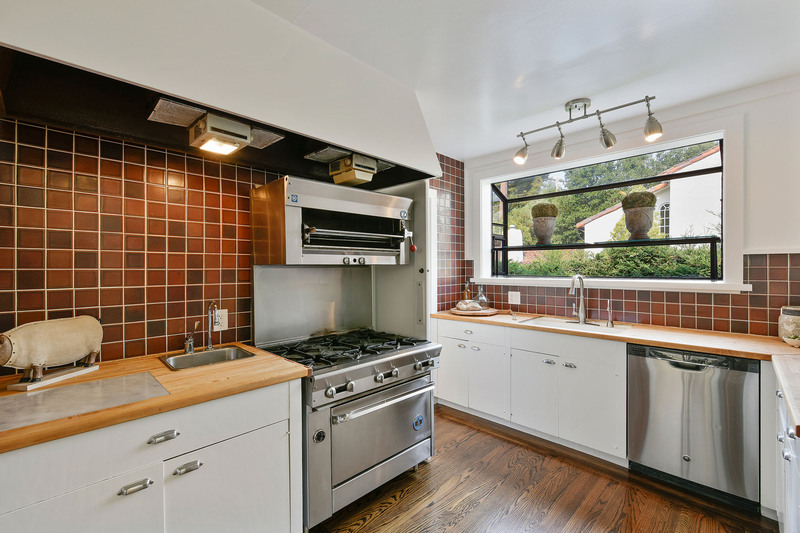 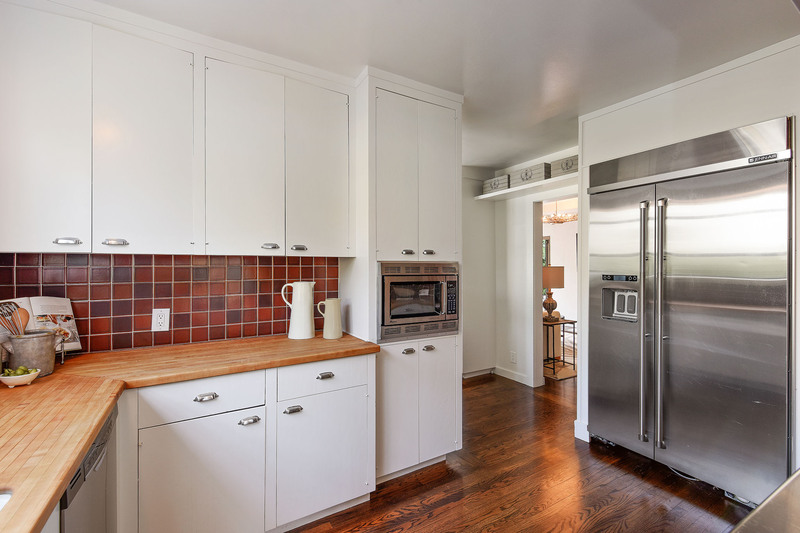 A swinging door leads to the efficient chef’s kitchen with professional appliances. 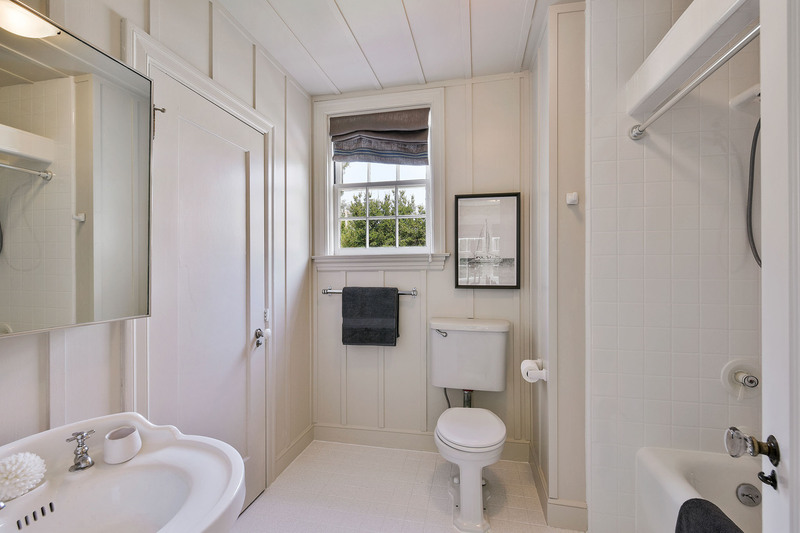 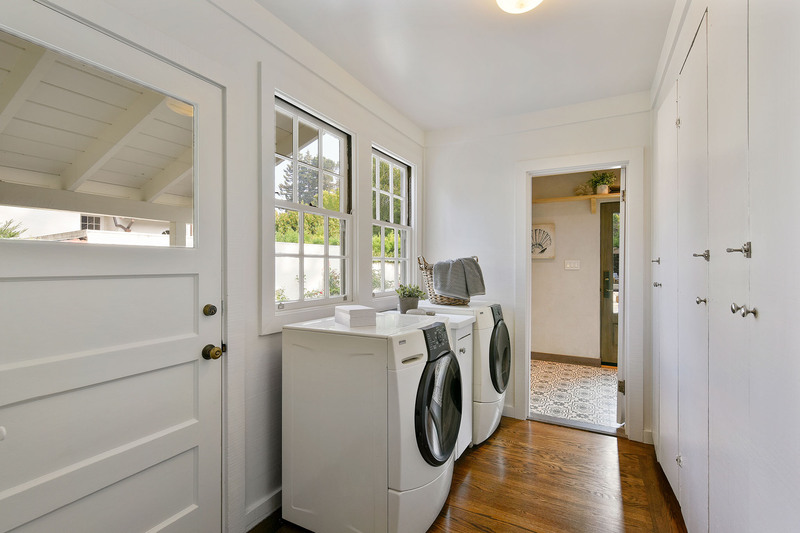 Nearby, perfect for multi-tasking, is a spacious laundry area, filled with natural light, and lots of storage. 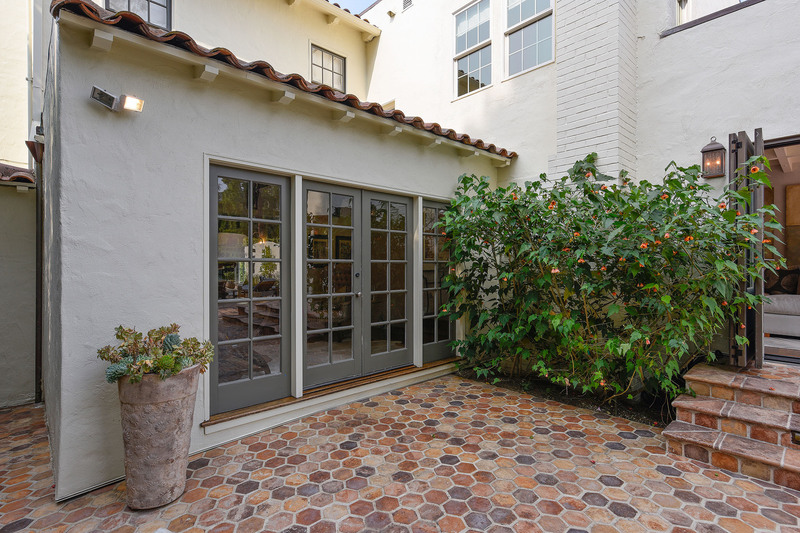 A side entrance makes it easy to unload groceries, with generous pantry space nearby. 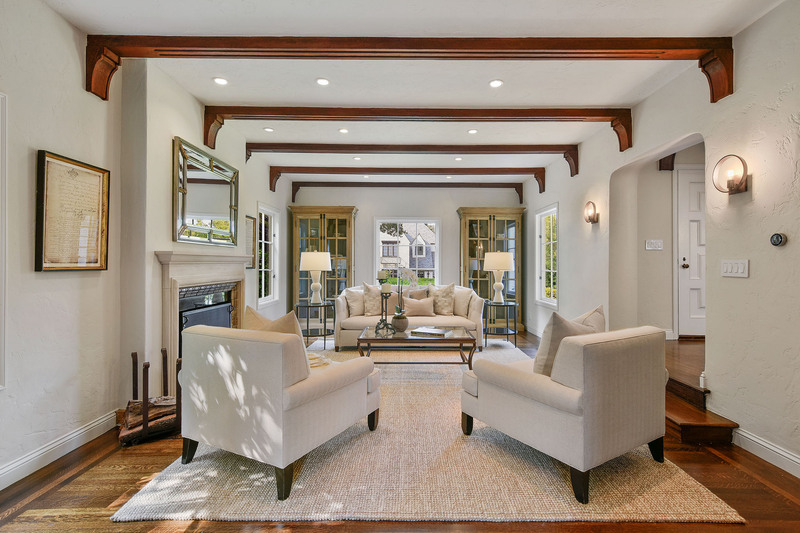 A large family room can be opened up to the backyard wonderland. 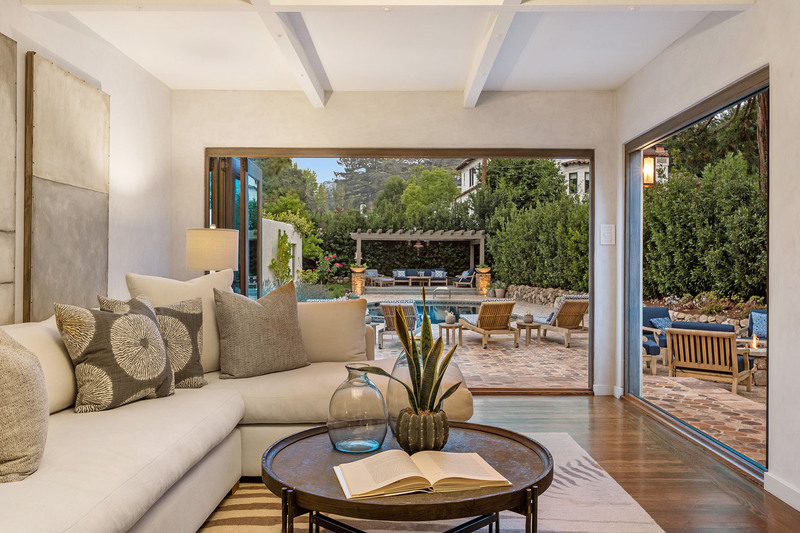 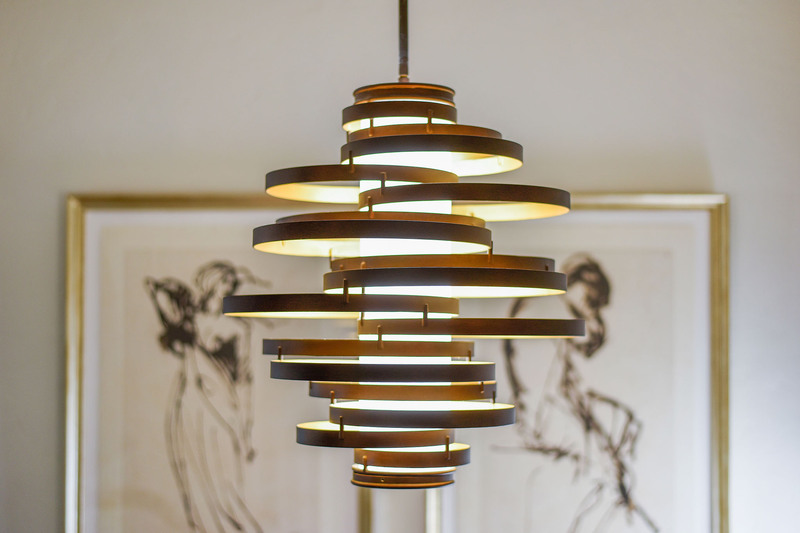 Lines between inside and out are suddenly blurred and guests and family can enjoy both with ease. 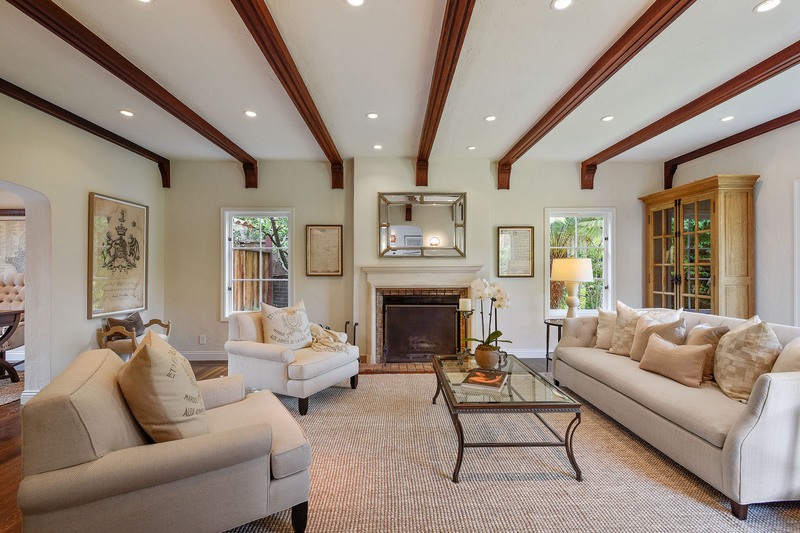 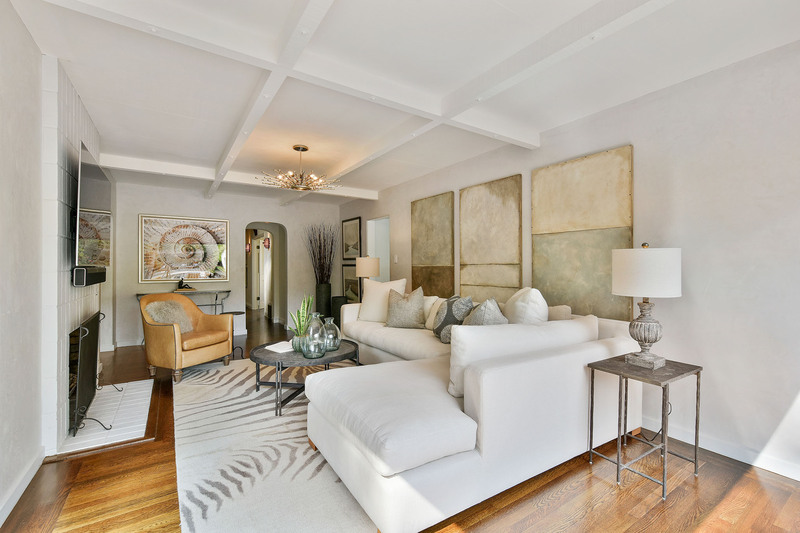 With beamed ceiling and hand rubbed Venetian plaster walls, plus a wood burning fireplace, the space evokes warmth and charm. 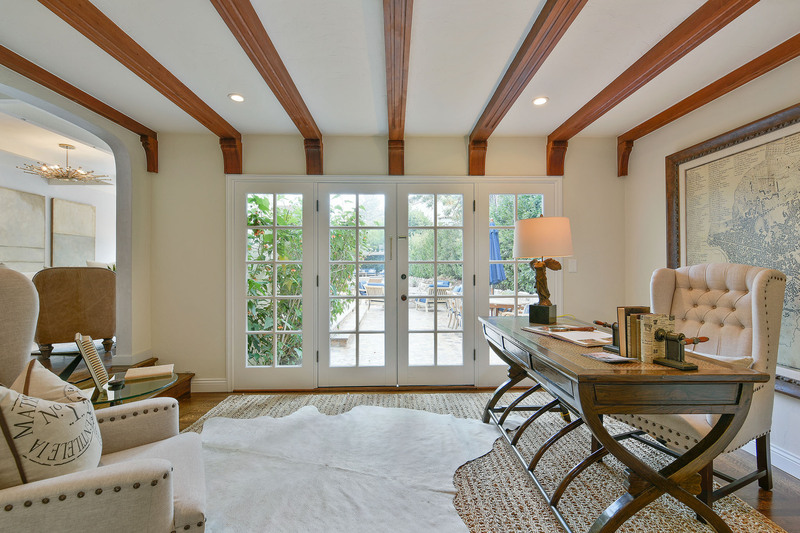 Adjacent to the family room is a window lined space that is ideal for a library or home office. 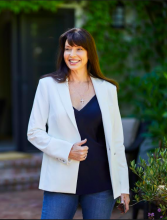 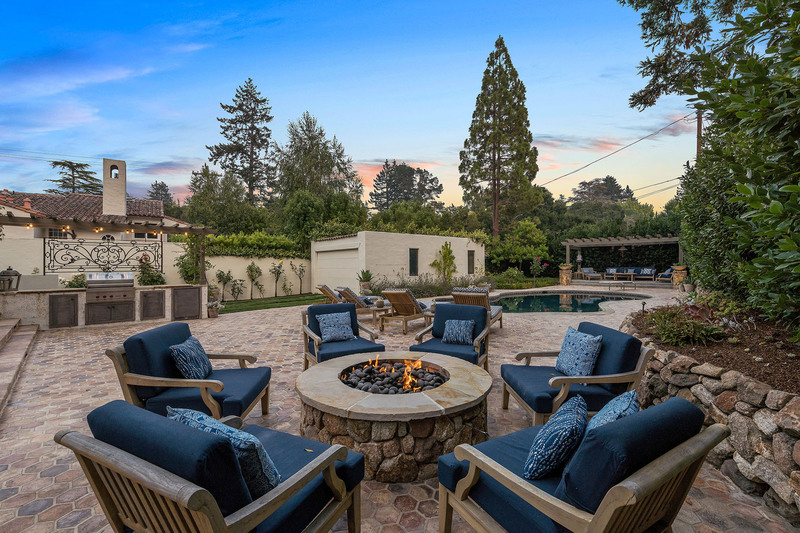 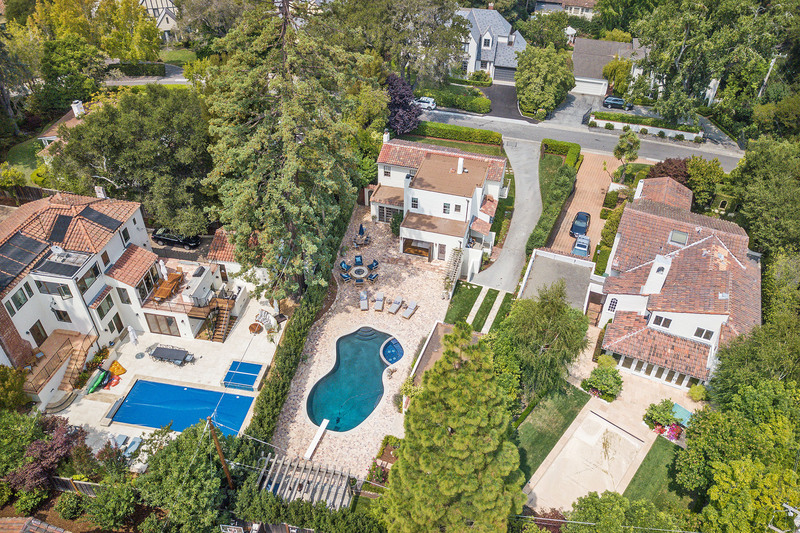 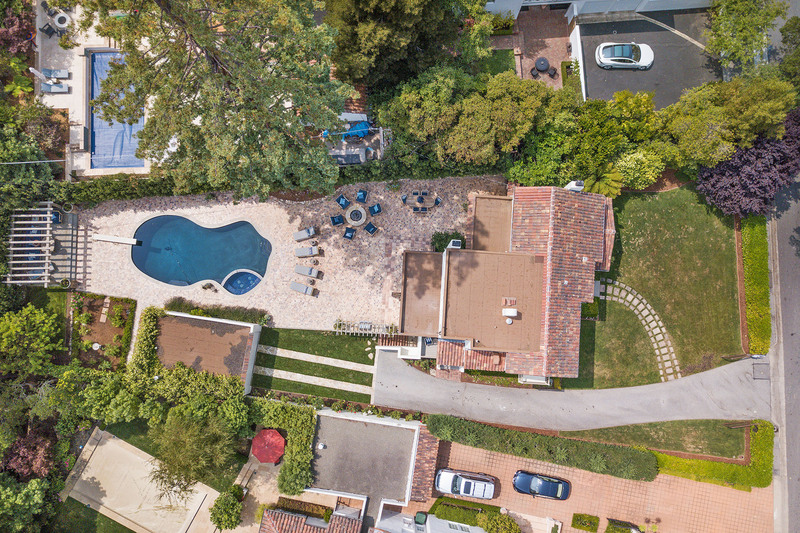 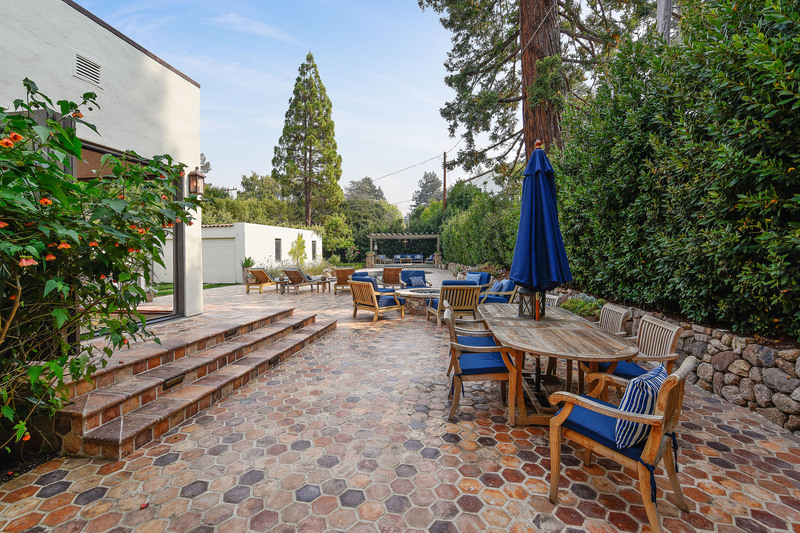 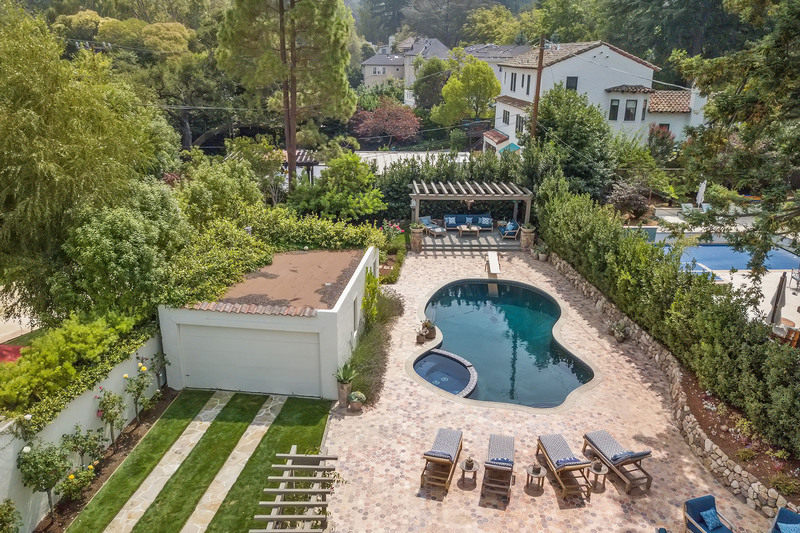 The backyard captures the spirit and character of the home and has been thoughtfully landscaped to provide outdoor “rooms” for conversation, dining, entertaining, playing, gardening and more. 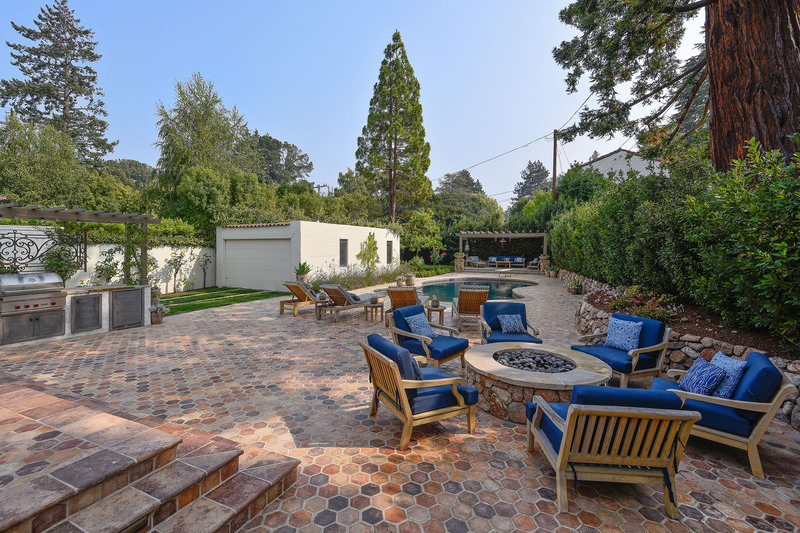 The spacious grounds maximize outdoor living. 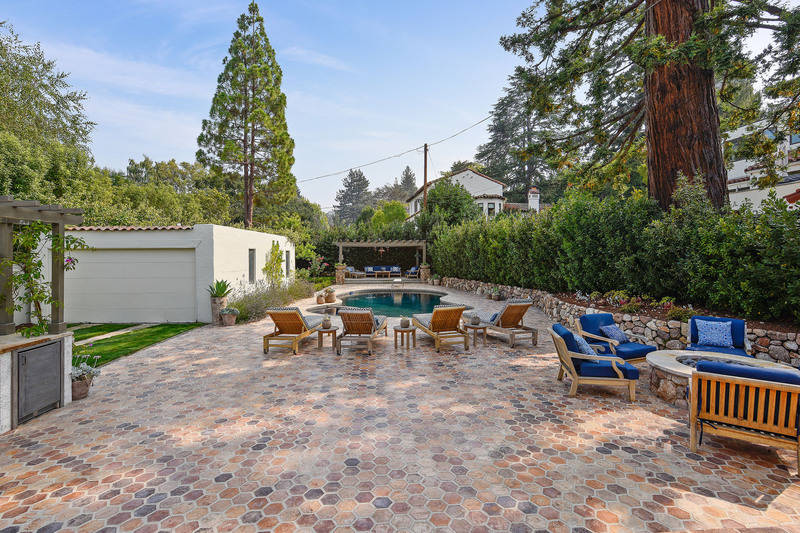 Attractive hexagon paver tiles cover a large deck where a built-in 30” Wolf BBQ is ready for the household’s grill master. 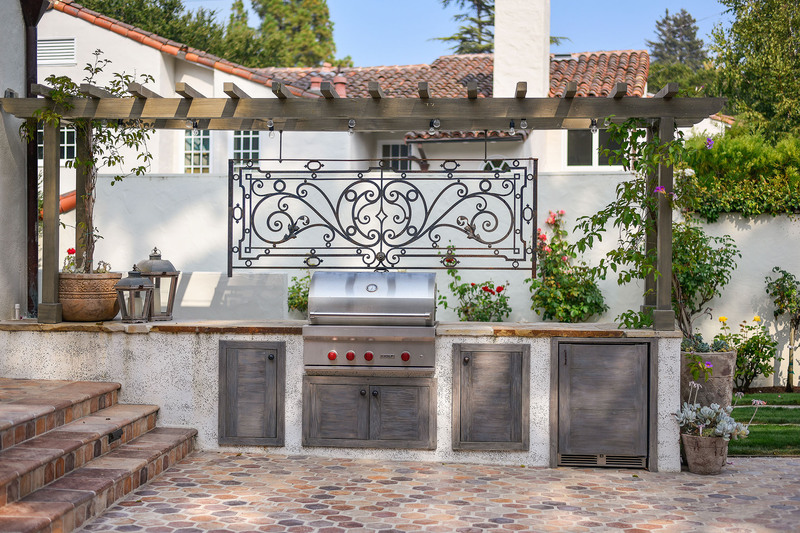 Also included in the outdoor kitchen is Perlick refrigerator for your beverages. 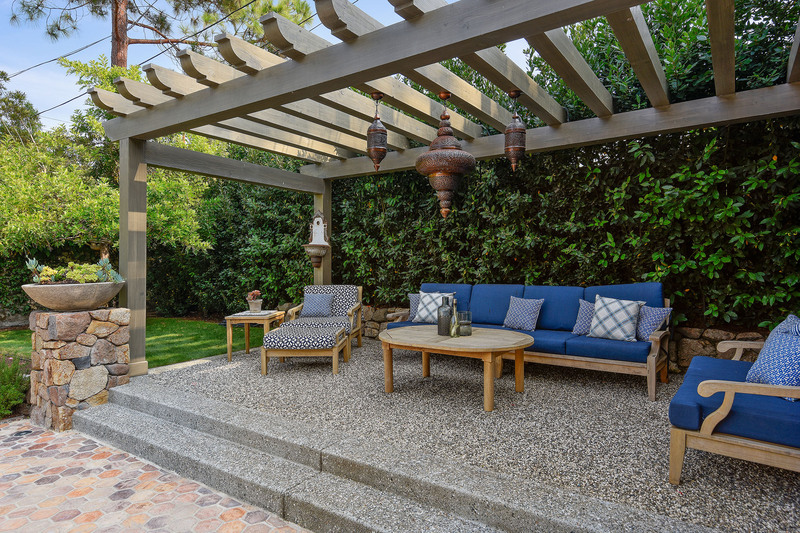 Surrounded by counter space and storage you have the perfect setting for an al fresco repast. 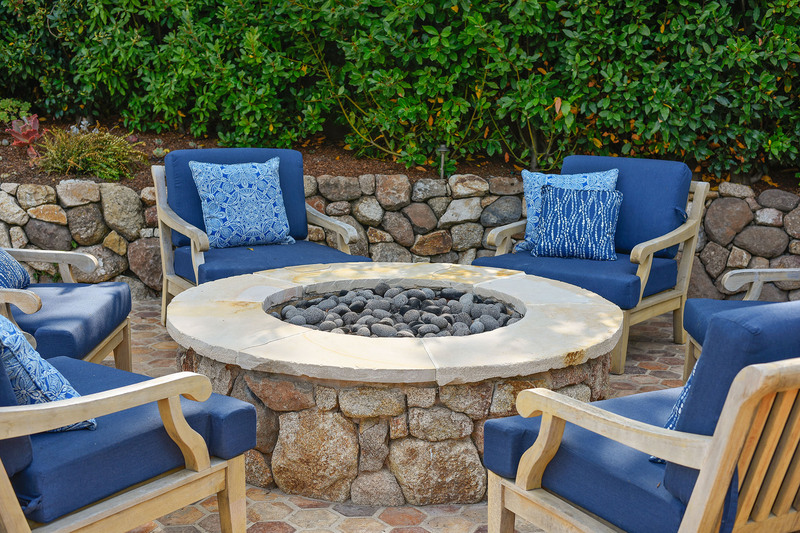 A stone fire pit warms cool evenings and encourages conversation. 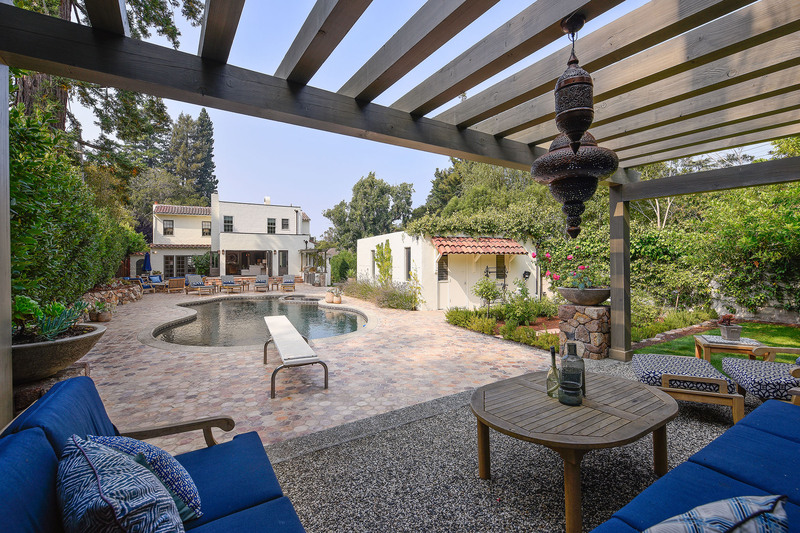 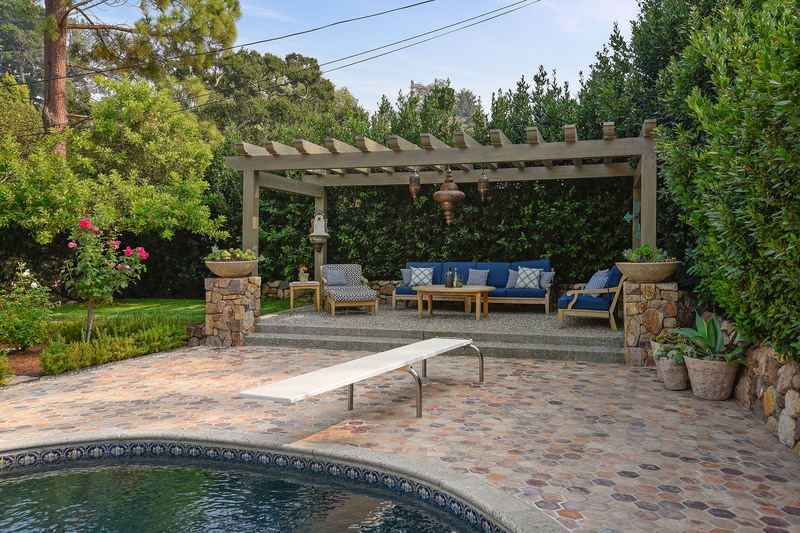 An inviting seating area at the end of the property is elevated and shaded by a pergola, and has views of the pool, fragrant rose garden, and the back of the home. 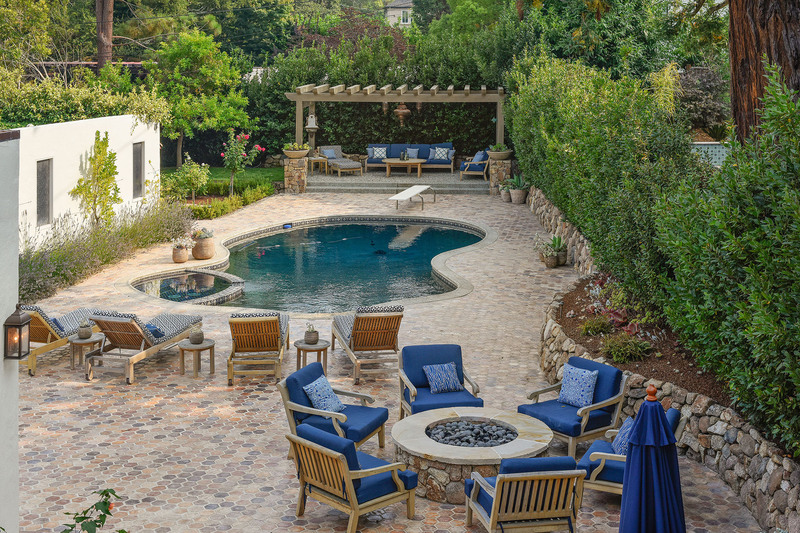 It is also the perfect spot to watch over pool activities, for those who like a little less sun. 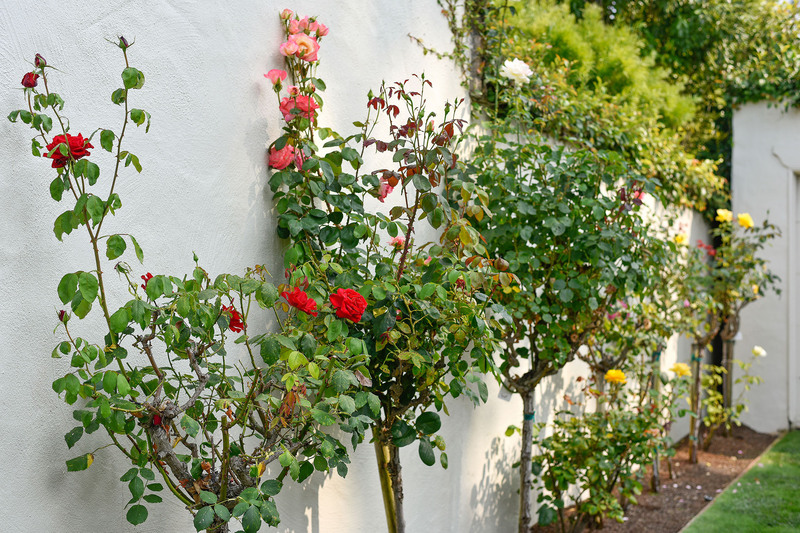 Dry-stack stone retaining walls border the yard and provide a natural planter for drought tolerant plants and succulents. 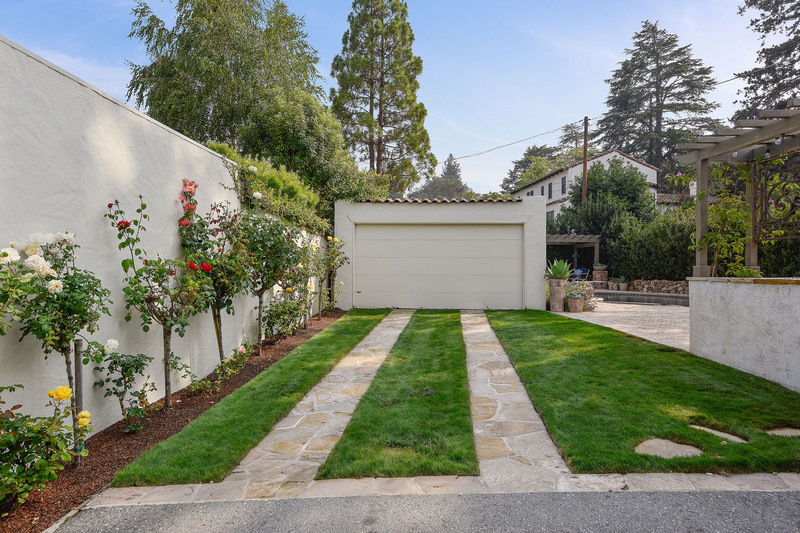 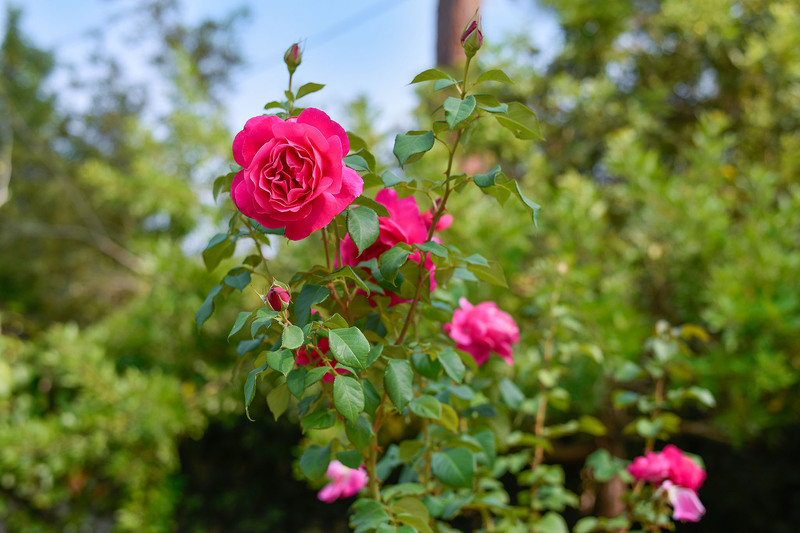 There are also espaliered, citrus trees along the garage, tree roses that line the drive and lush low maintenance fescue grass perfect for bare feet. 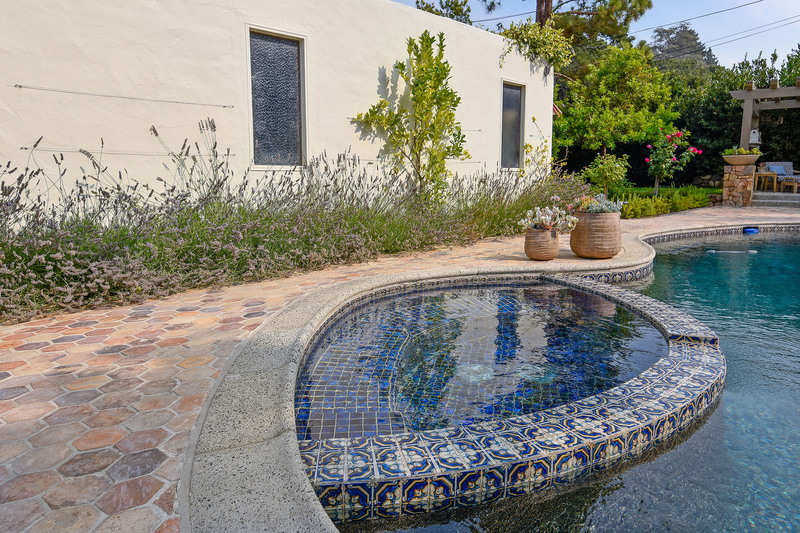 The free-form pool features a dark bottom Pebble Tec surface and a spa with Iberia tiles and waterfall feature. 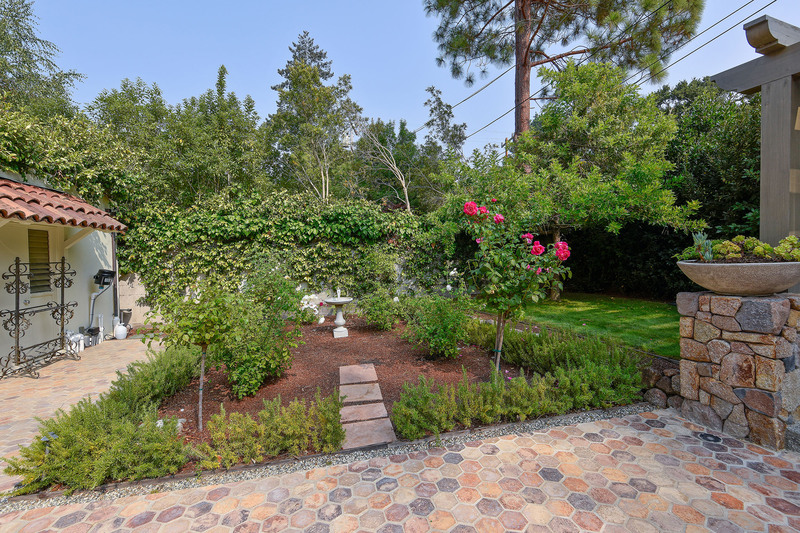 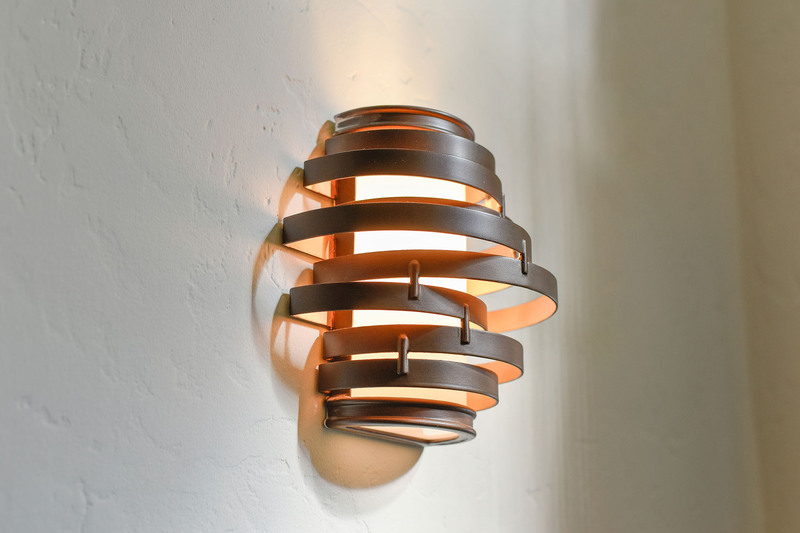 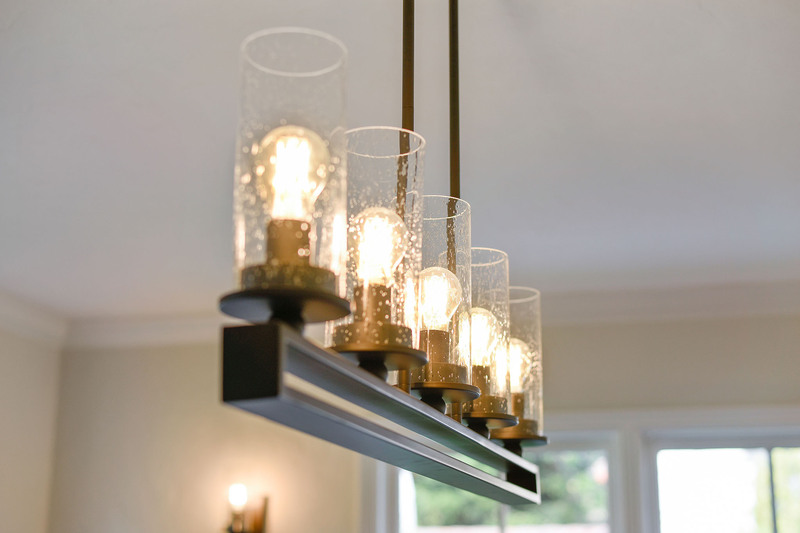 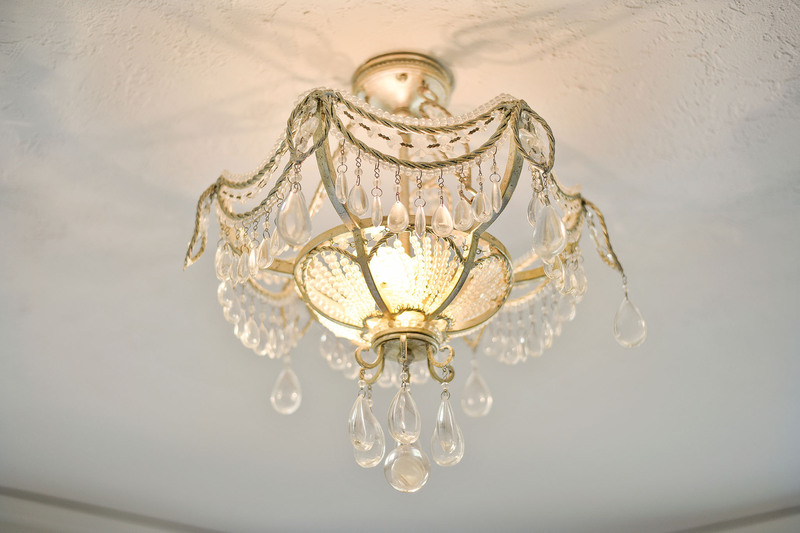 There is custom landscape lighting, convenient irrigation and wired for sound as added amenities. 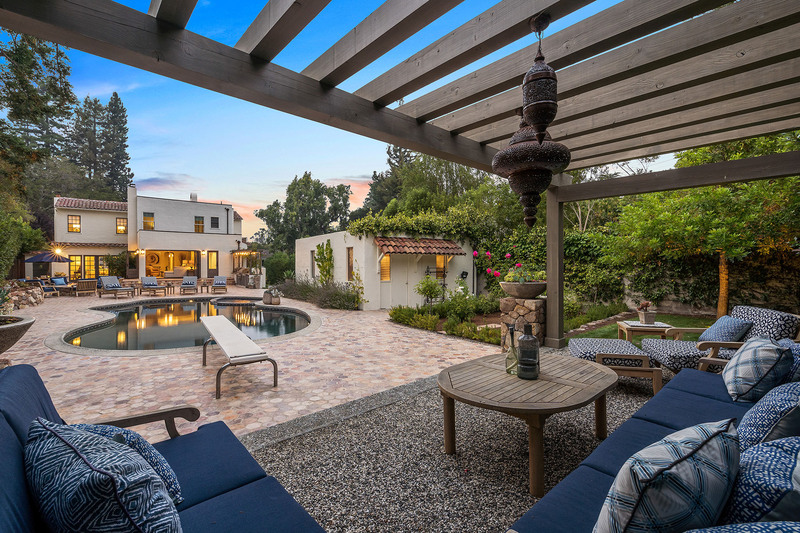 This outdoor oasis will make it hard to come inside...but luckily you don’t have to choose. 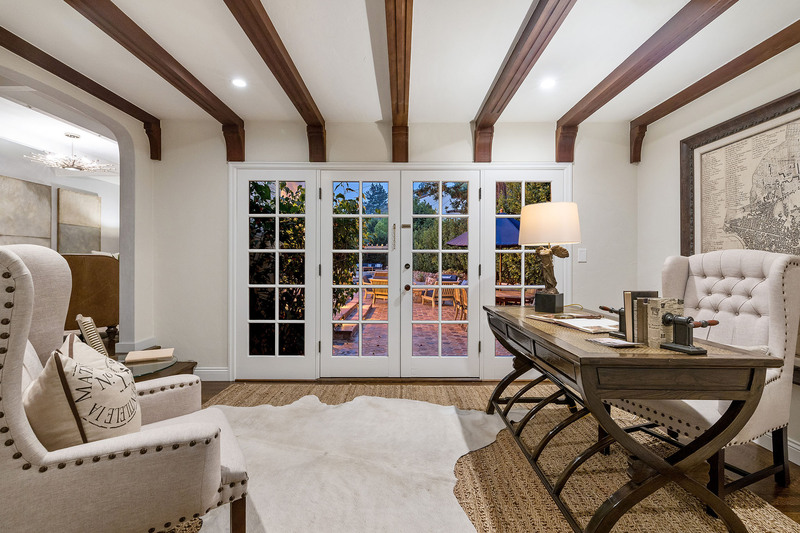 The NanaWall, fold-away door system off the family room means you can have the best of both worlds. 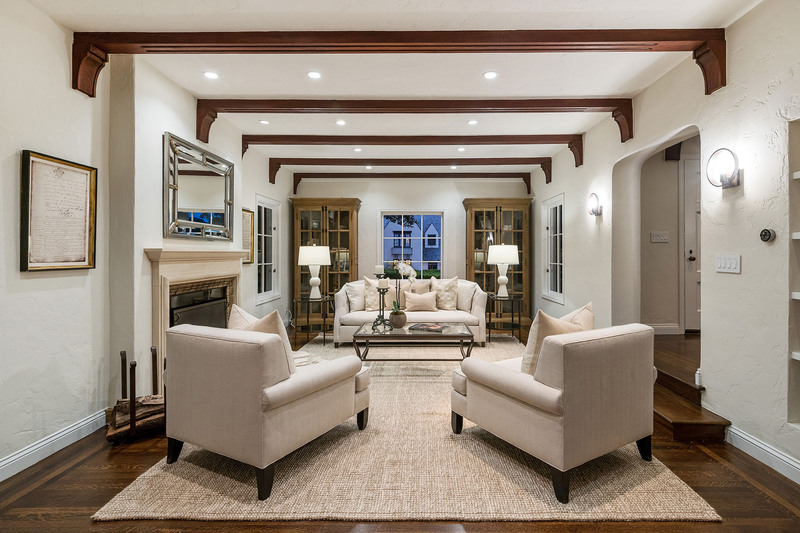 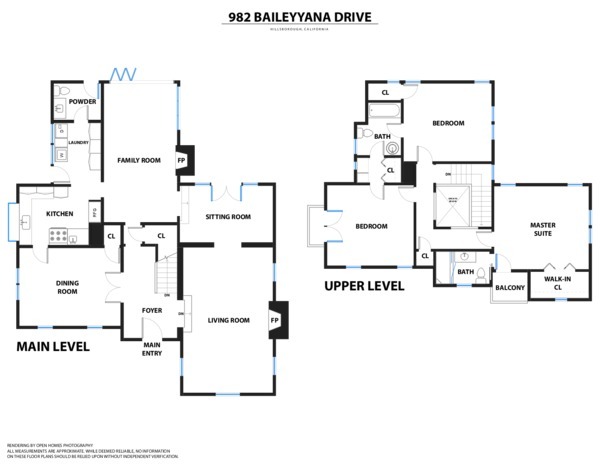 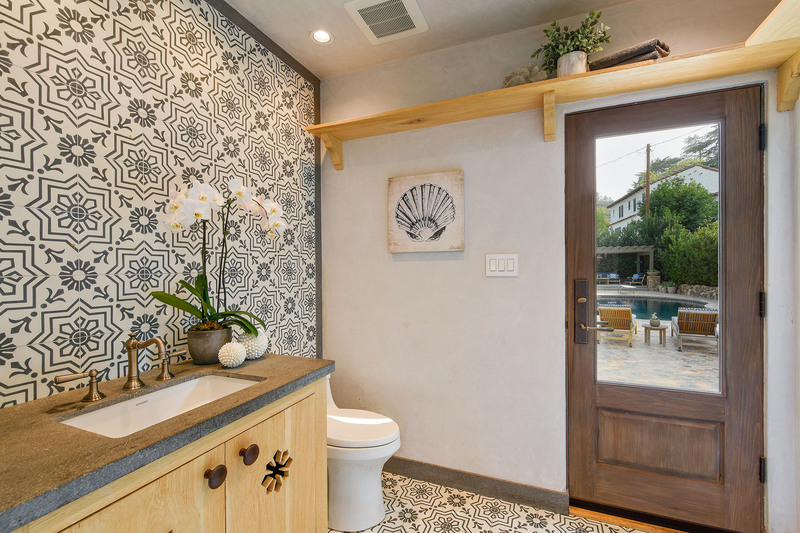 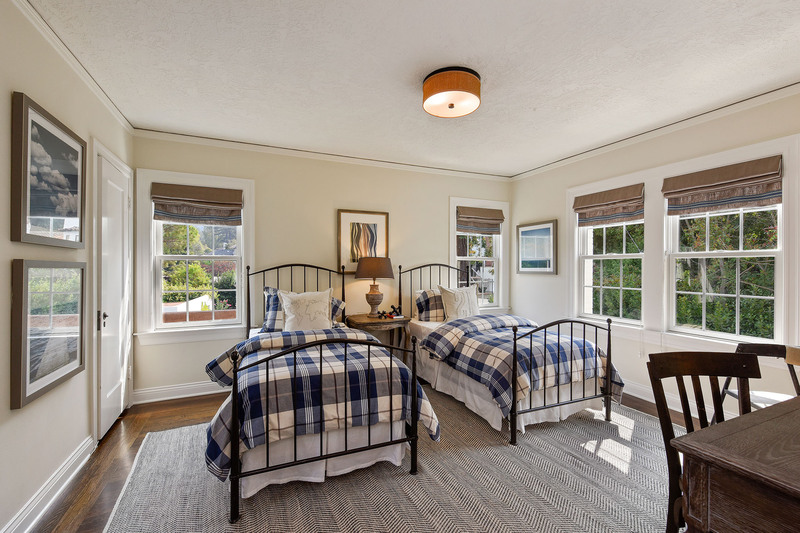 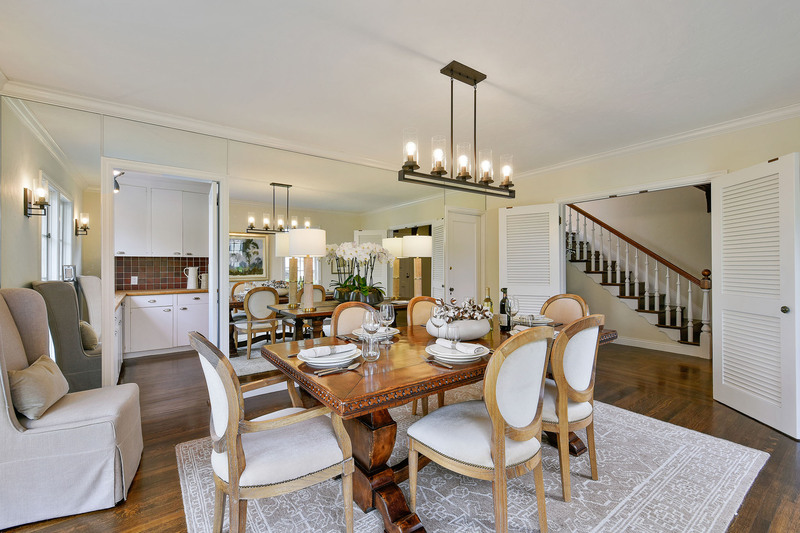 This home is a unique blend of historic detail, with a livable floorplan that offers many upgrades and the opportunity to expand or customized to match your lifestyle. 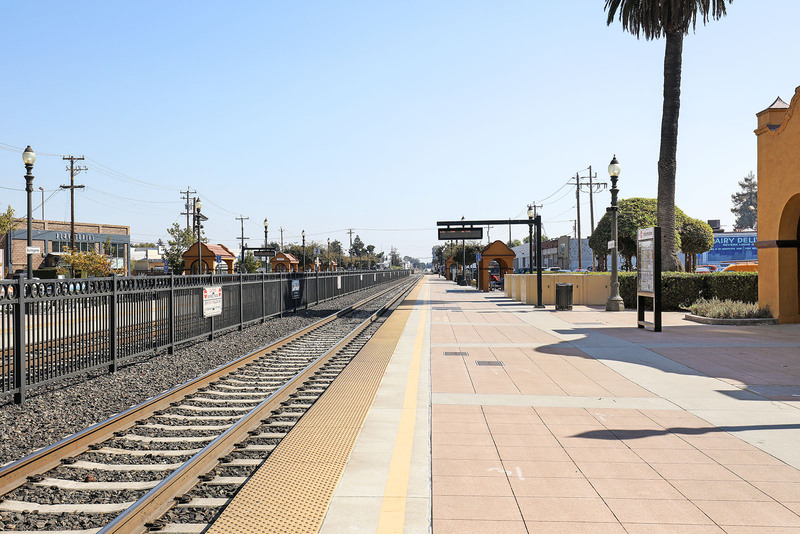 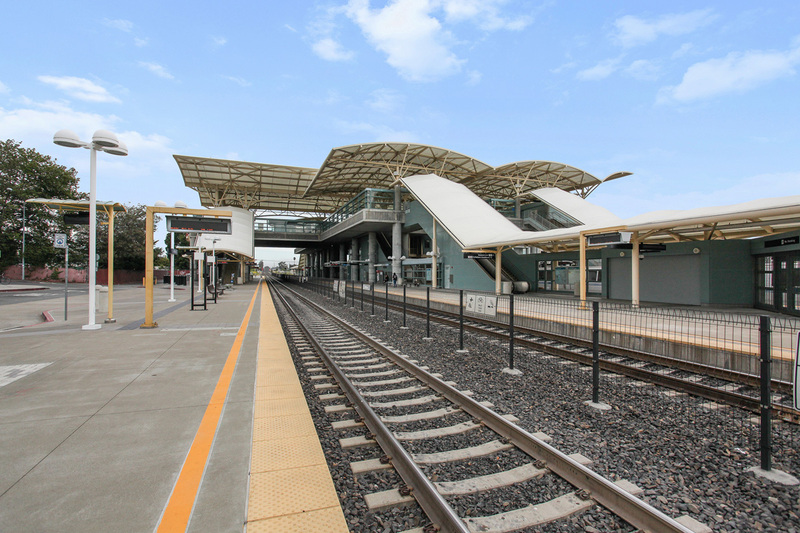 Commuters will applaud the Peninsula location. 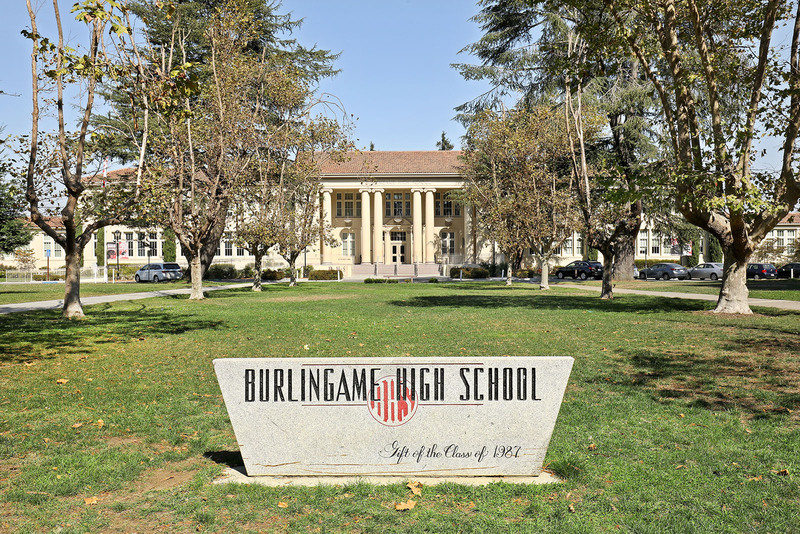 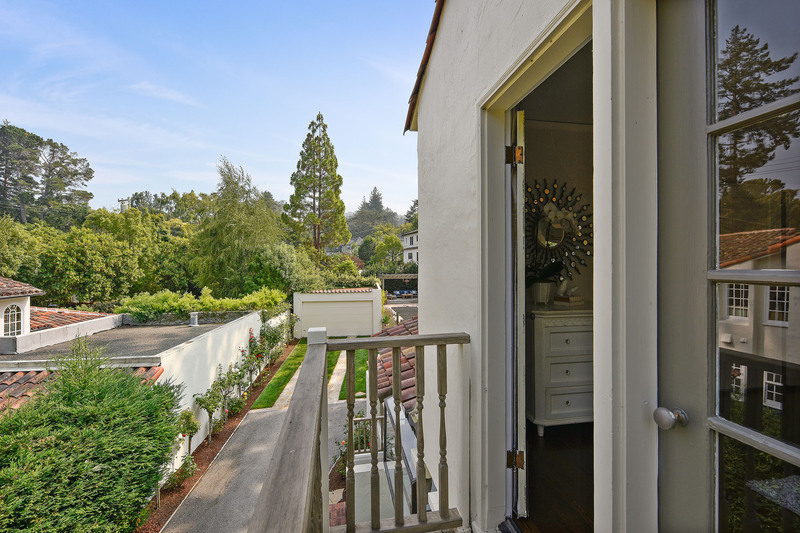 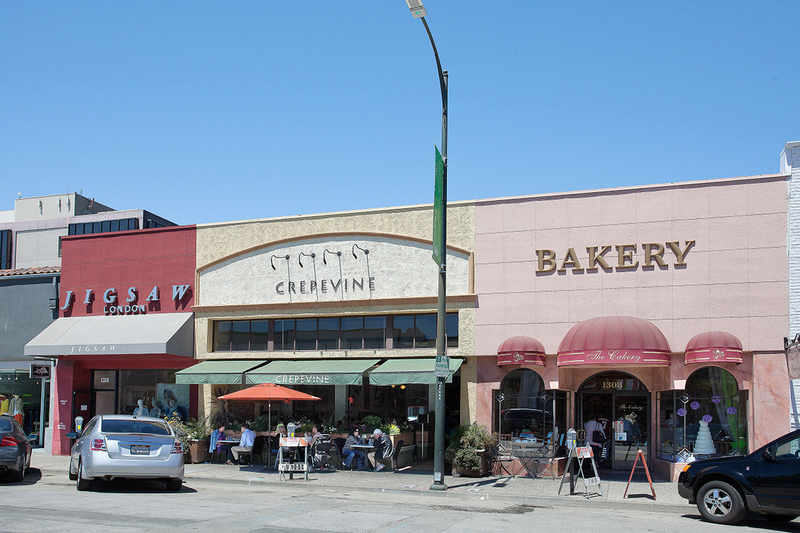 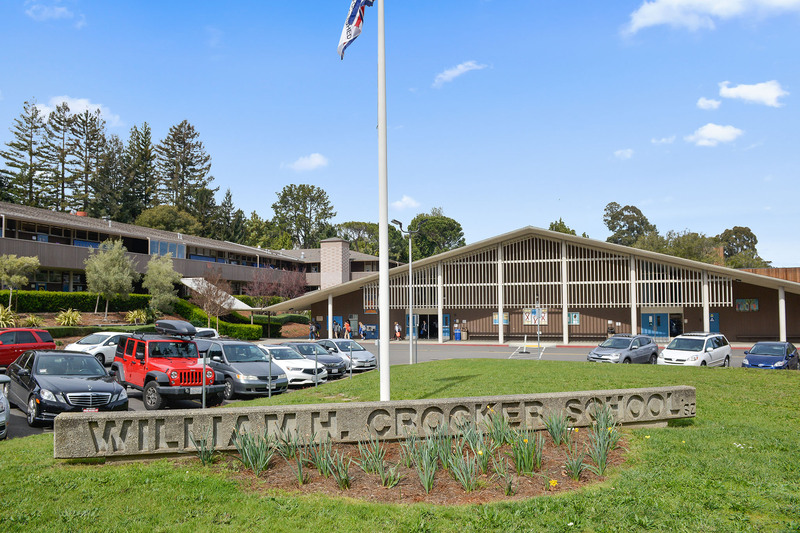 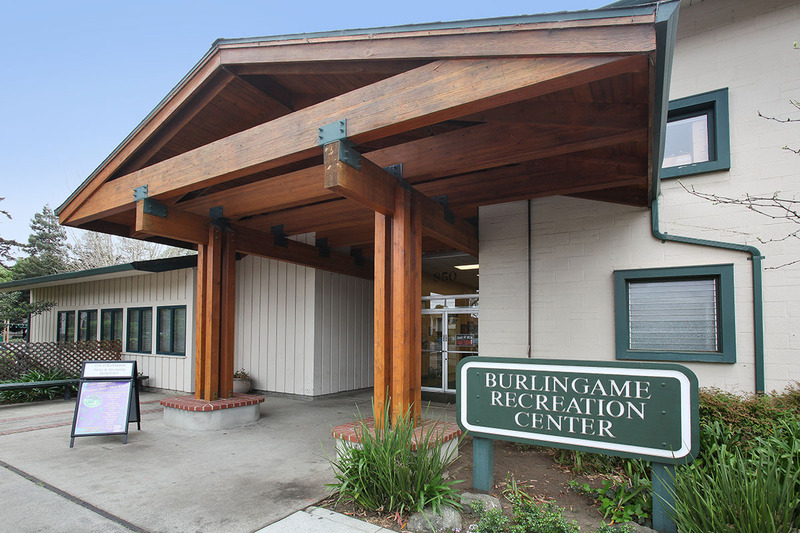 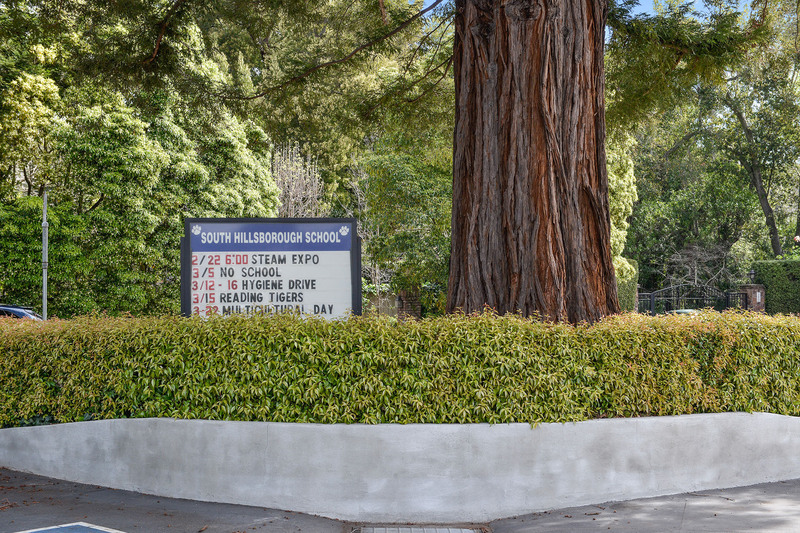 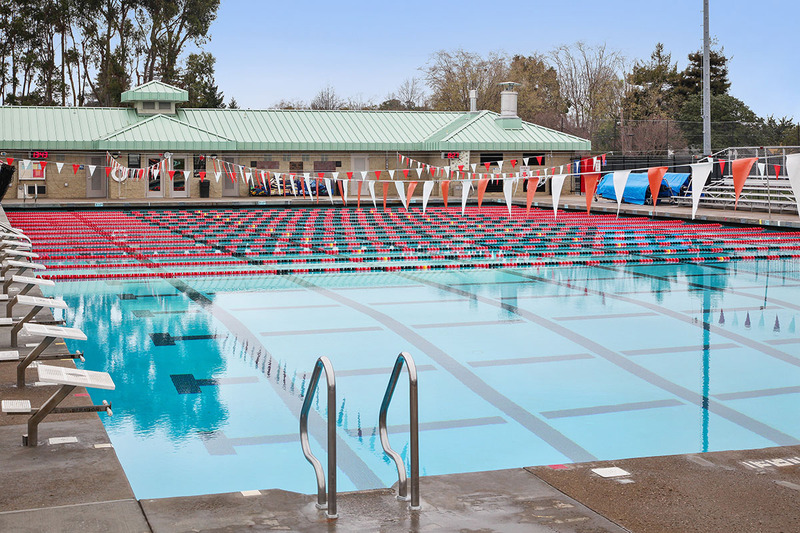 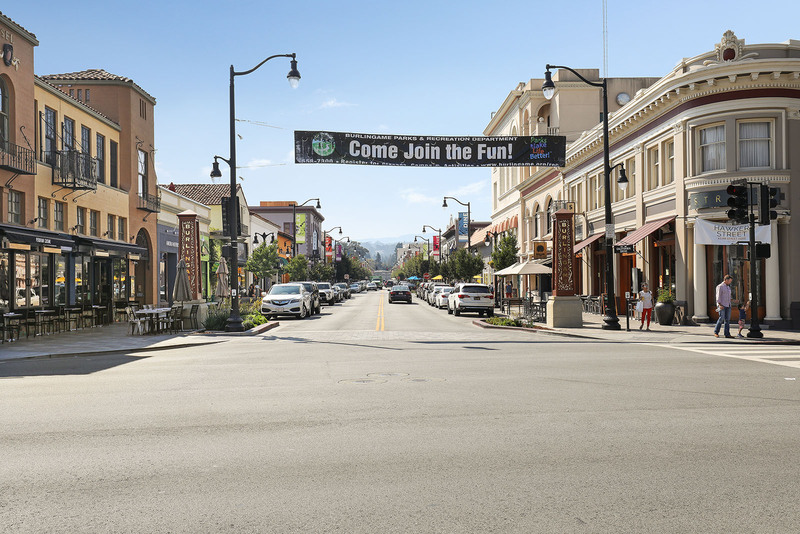 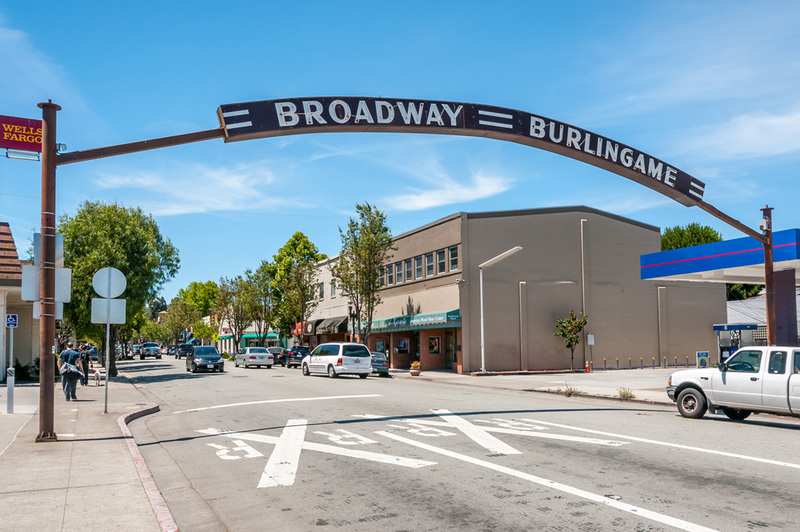 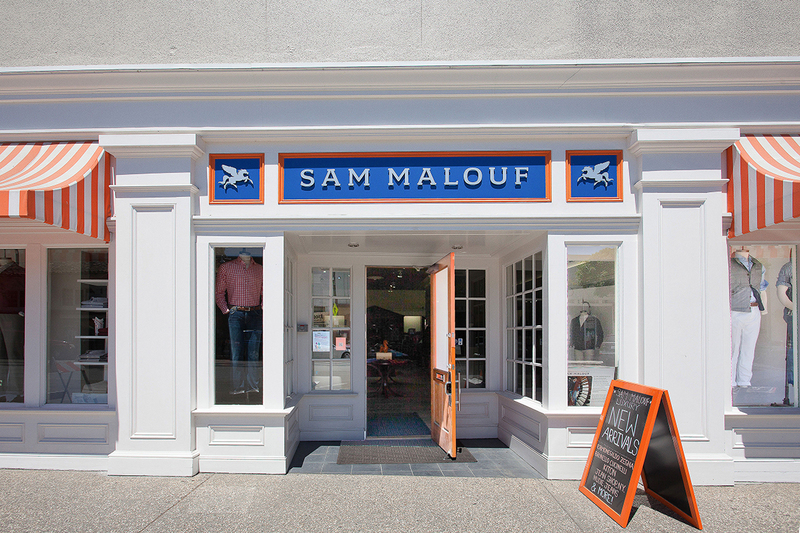 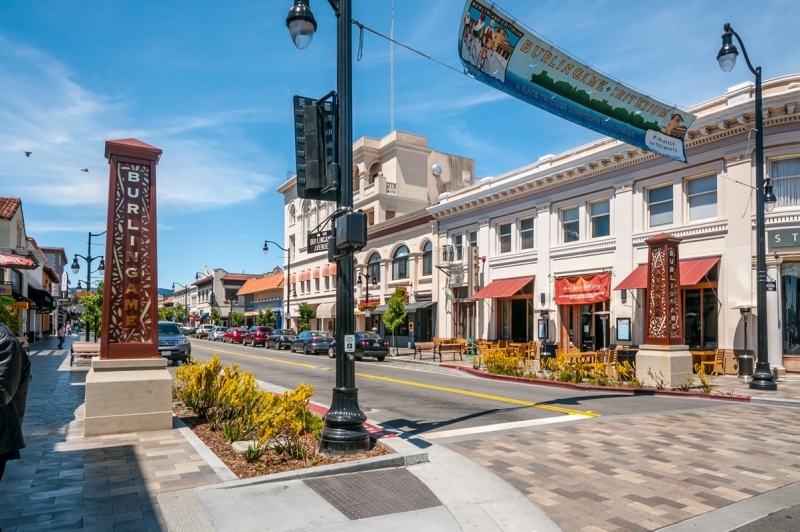 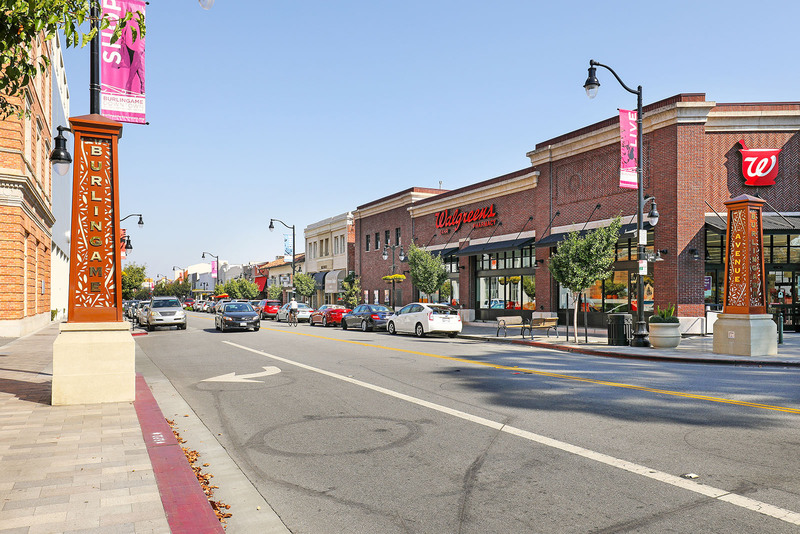 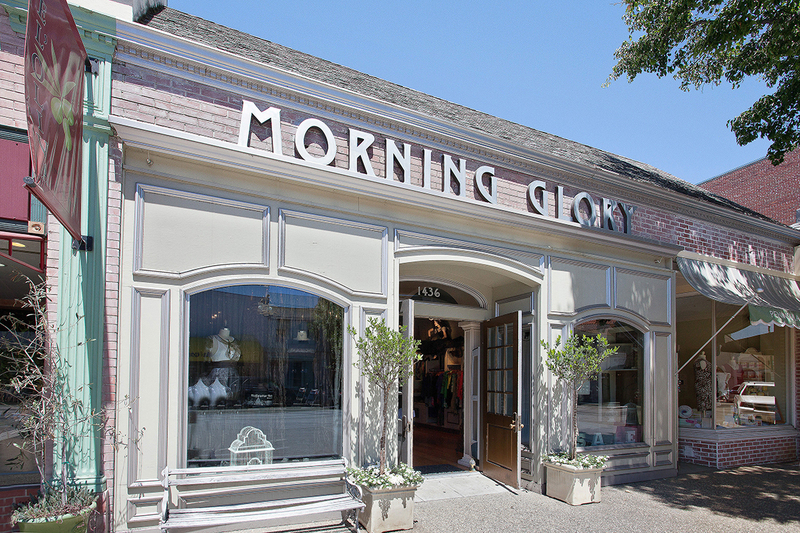 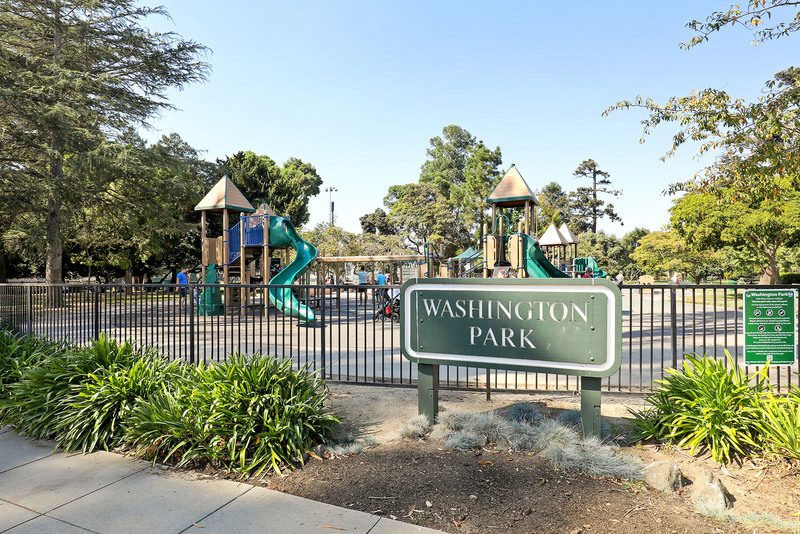 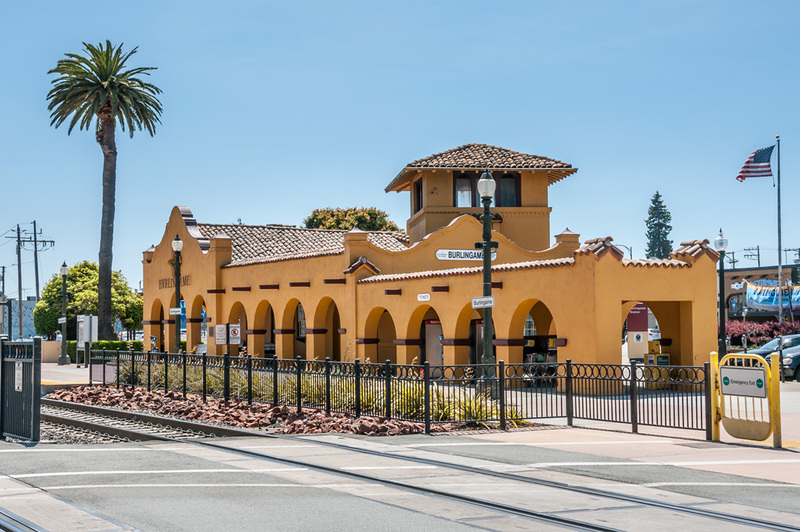 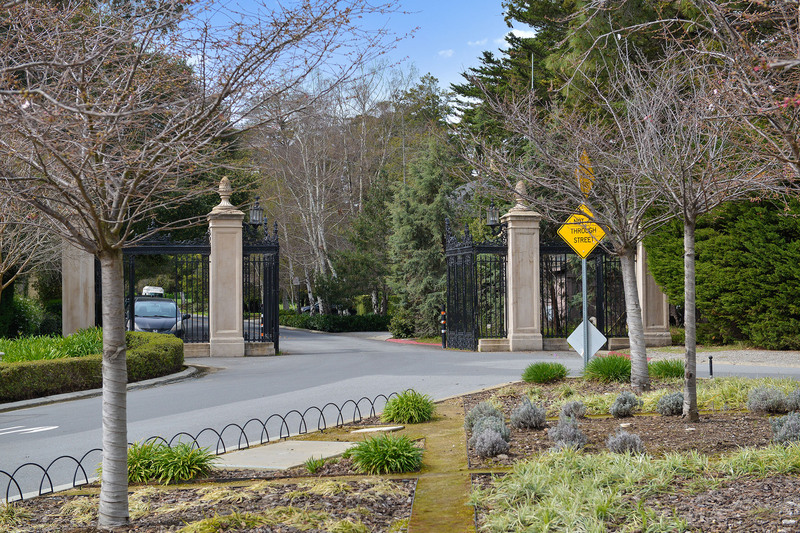 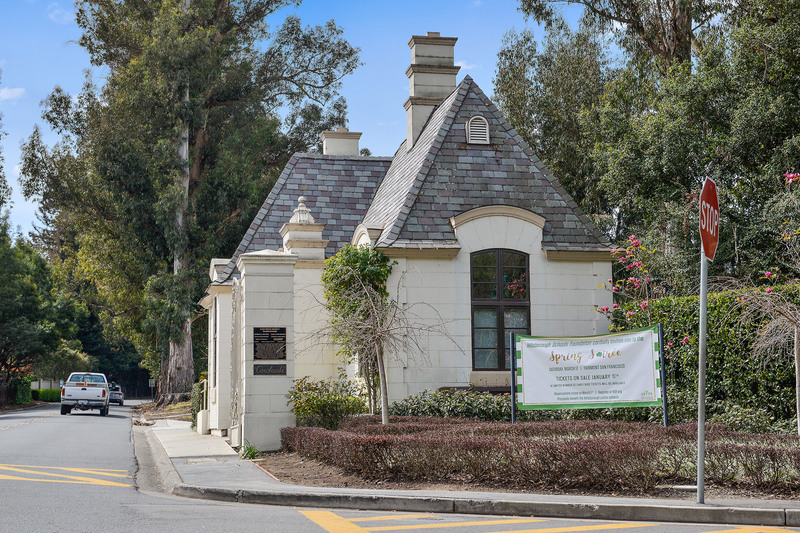 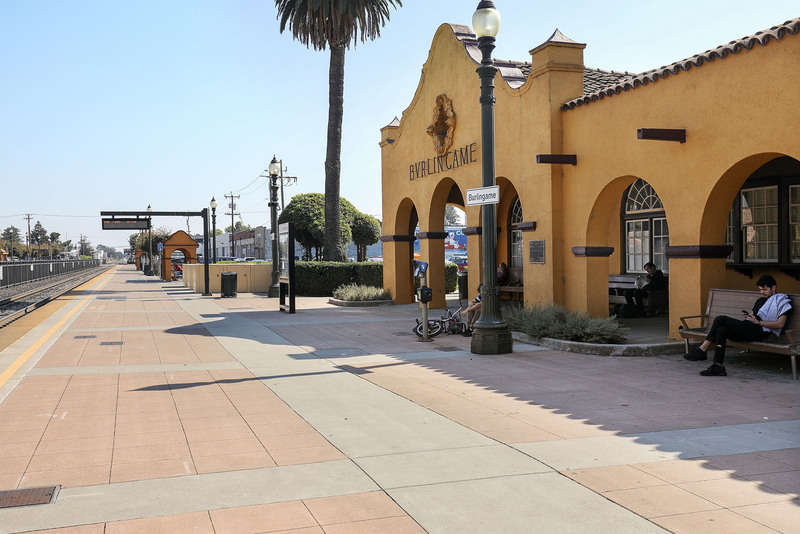 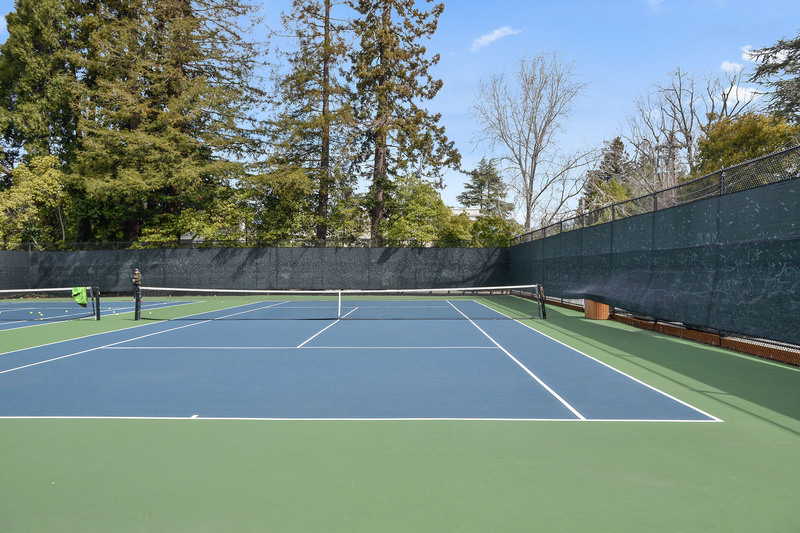 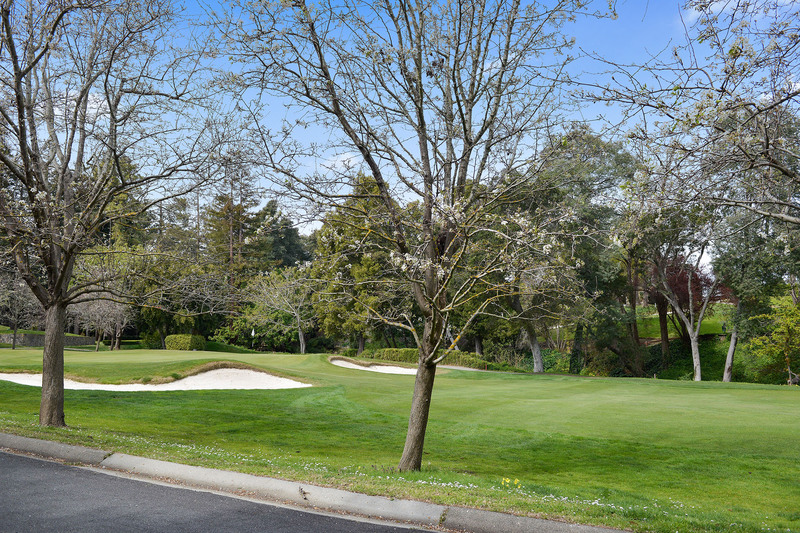 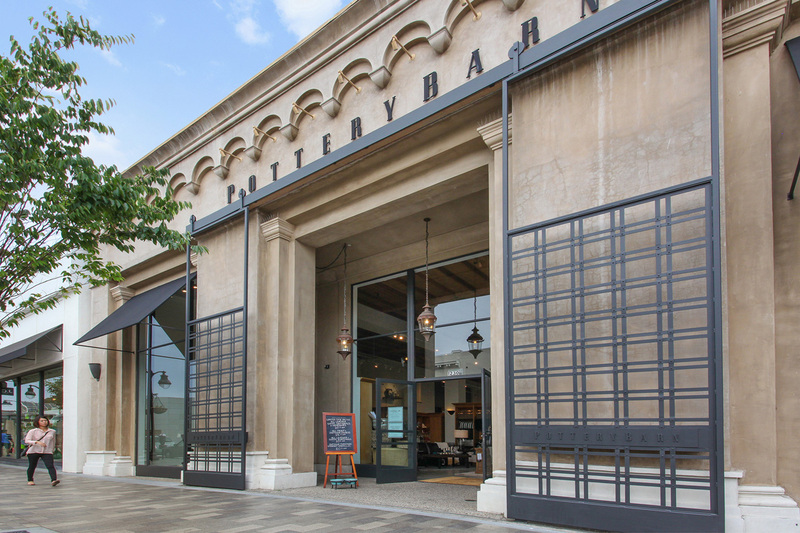 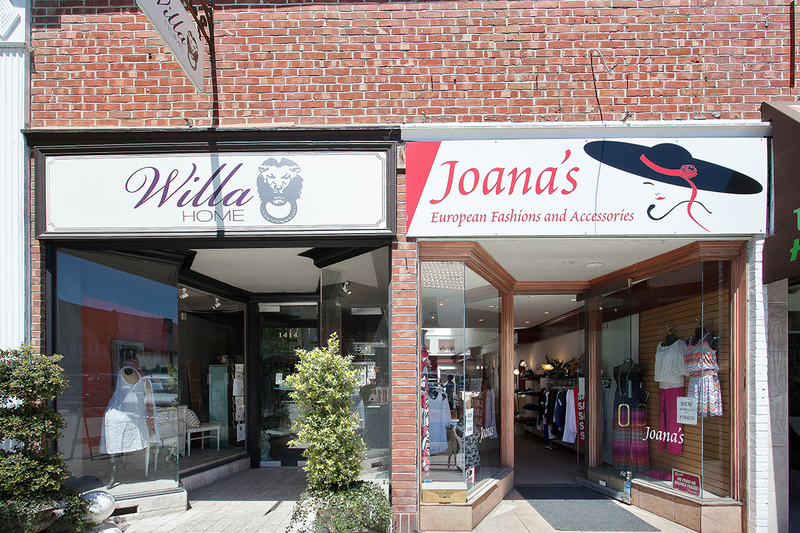 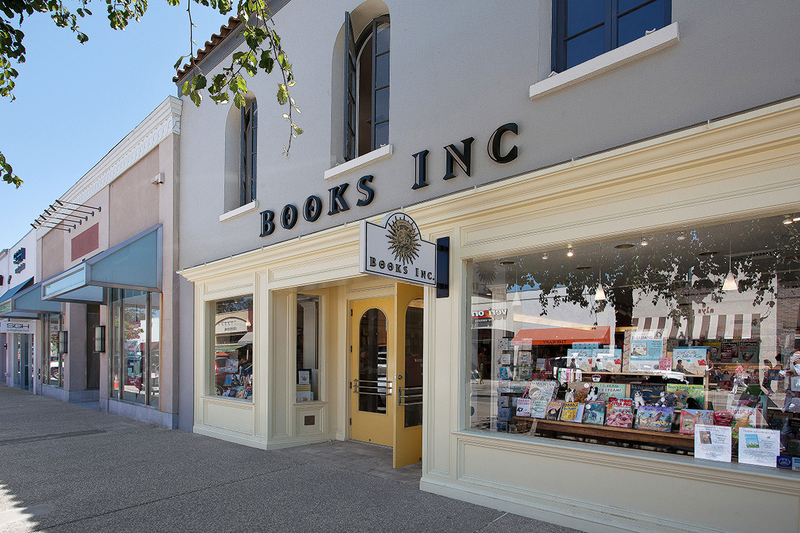 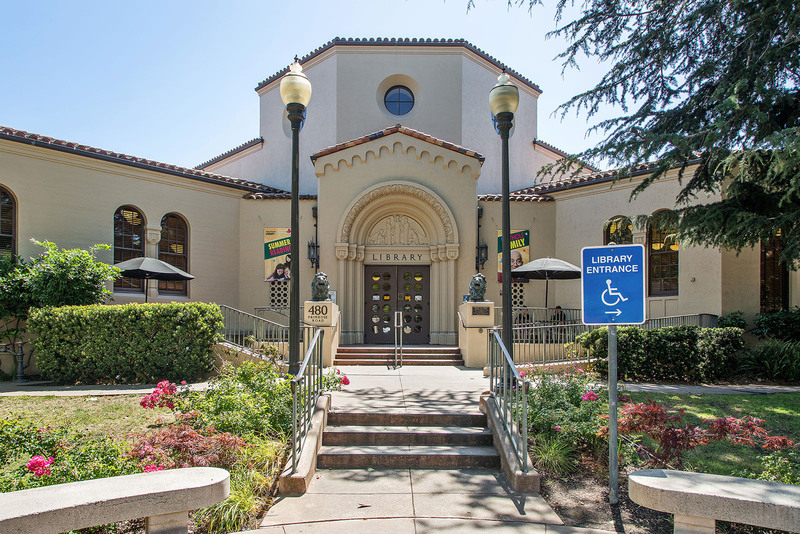 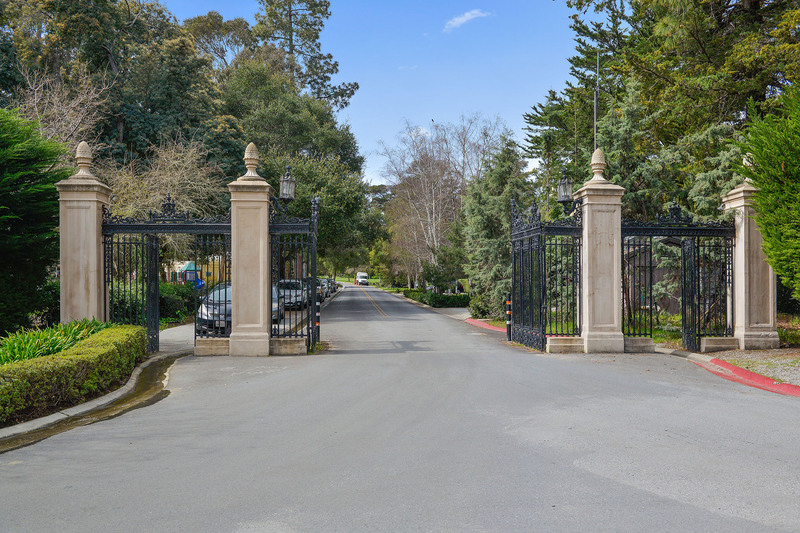 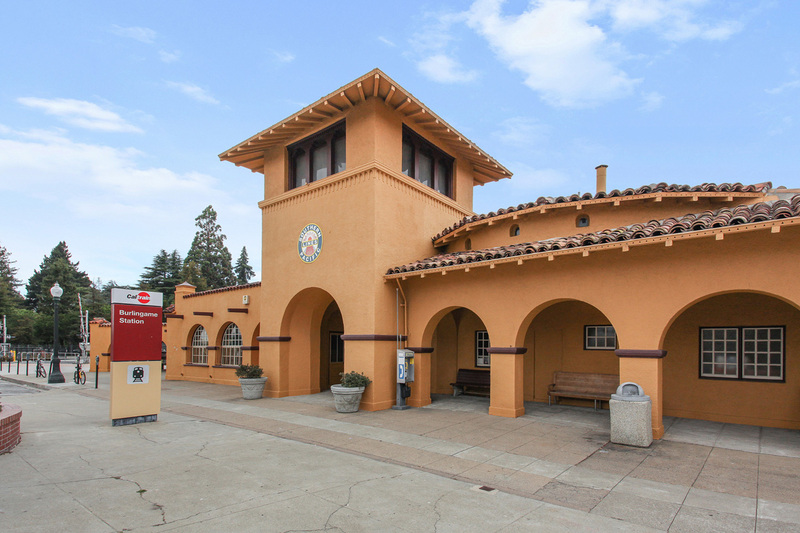 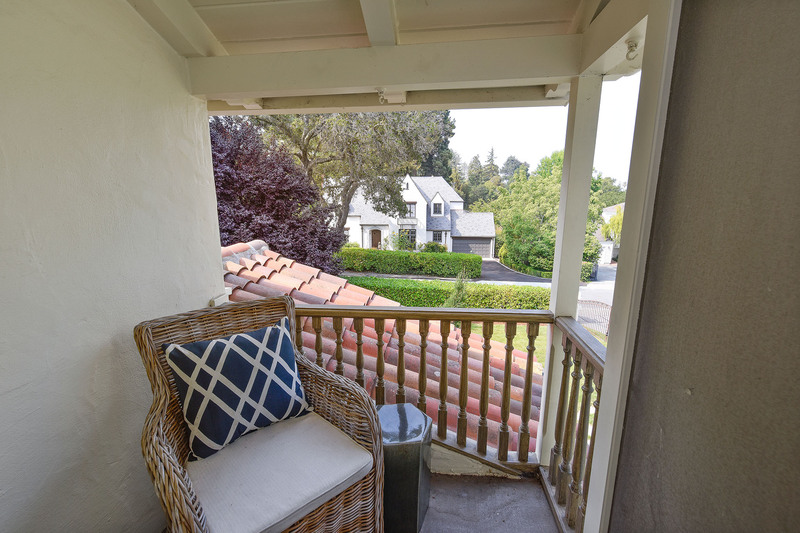 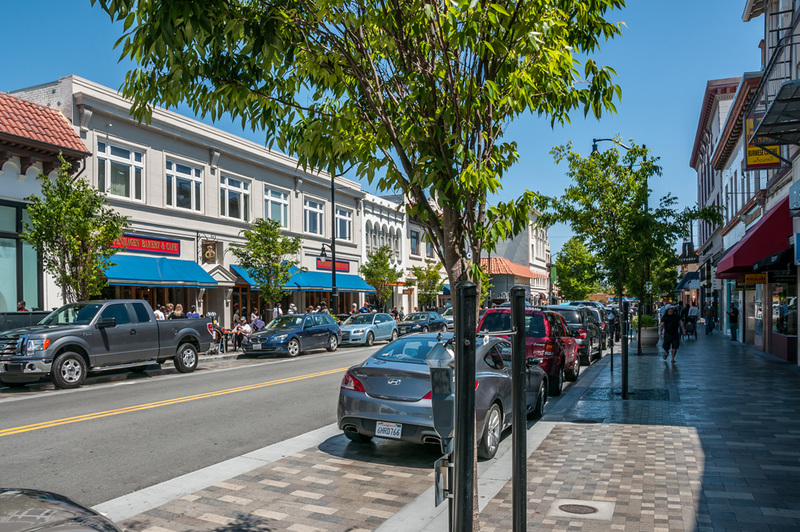 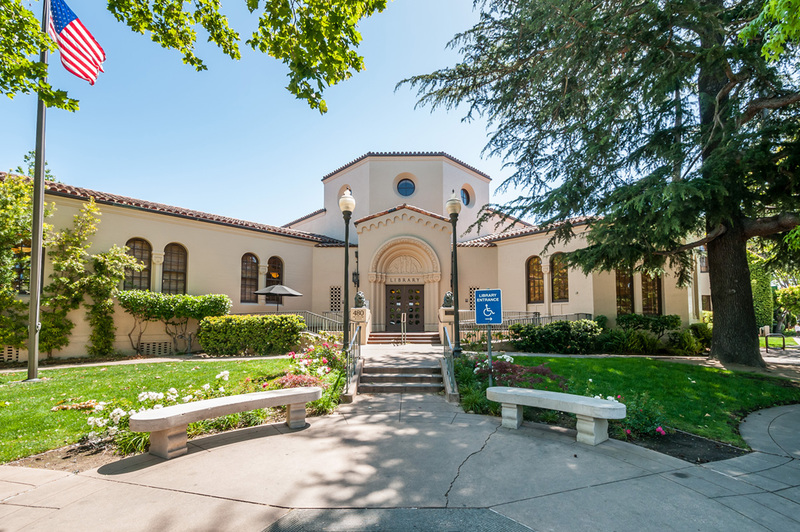 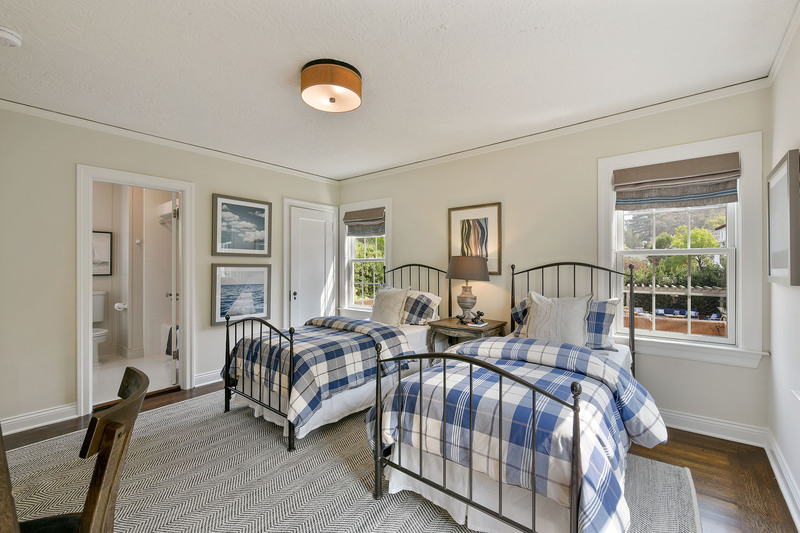 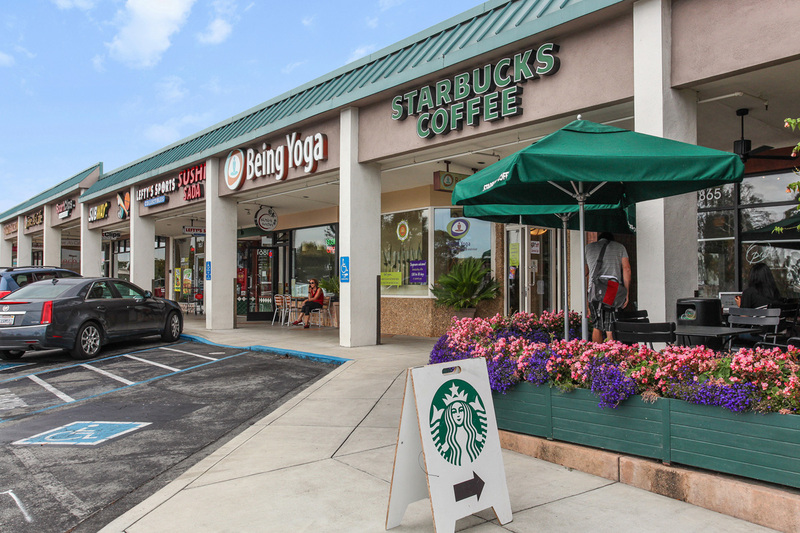 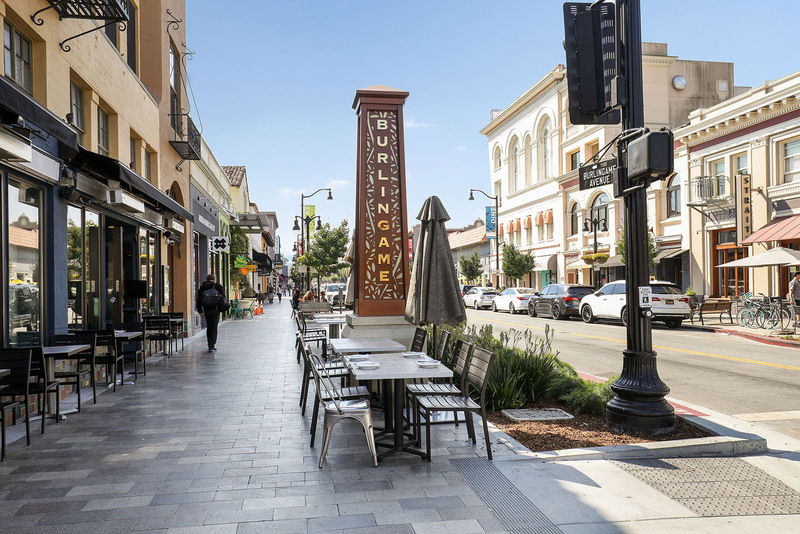 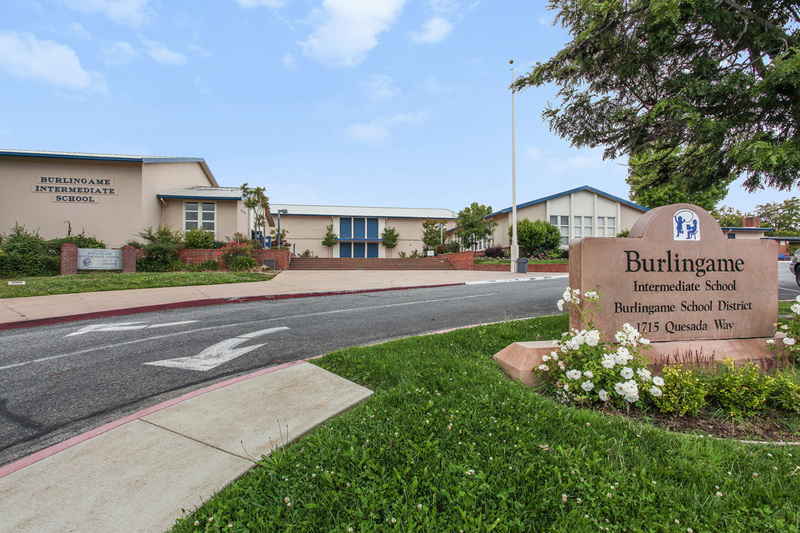 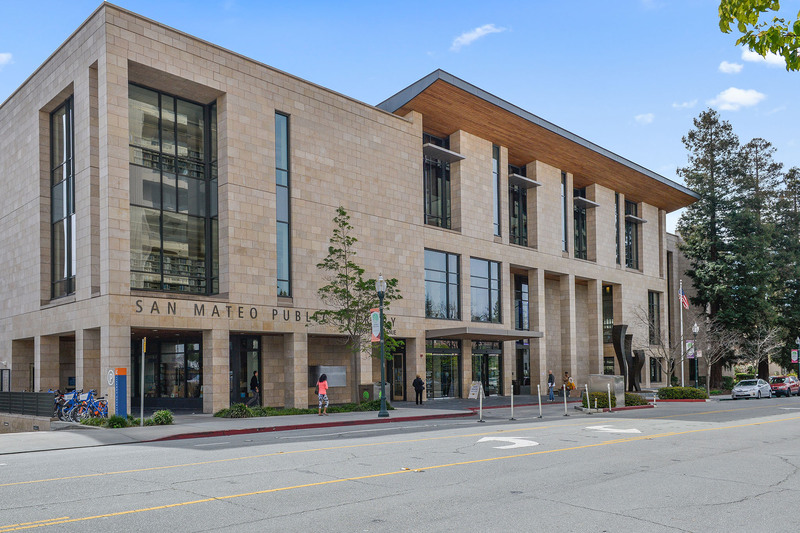 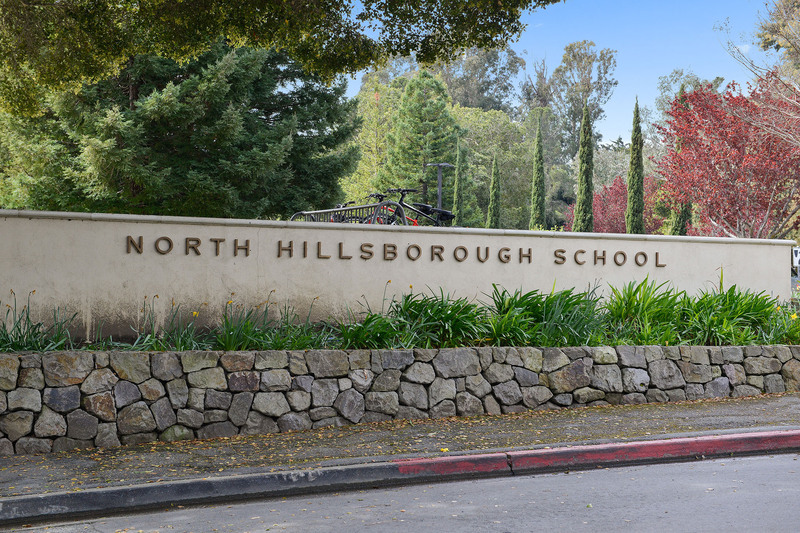 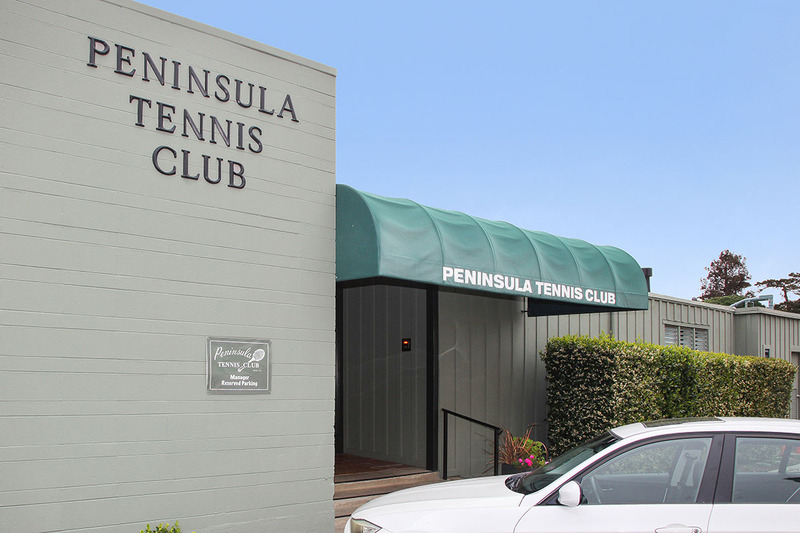 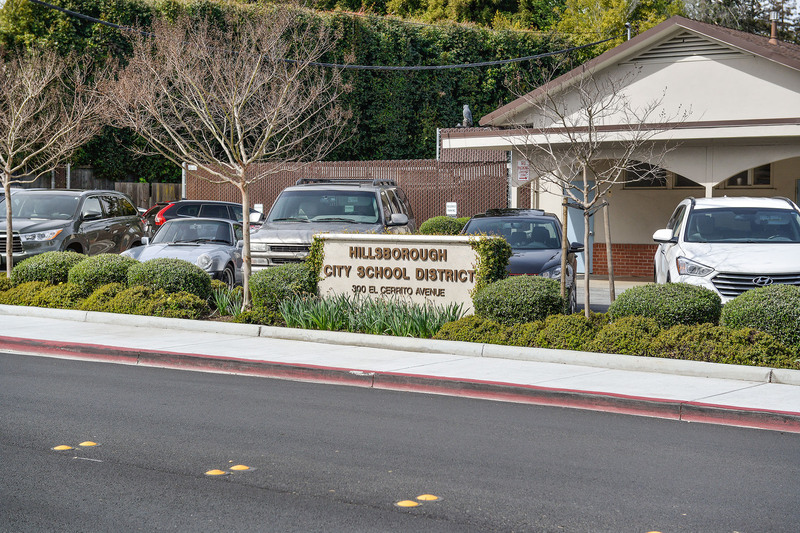 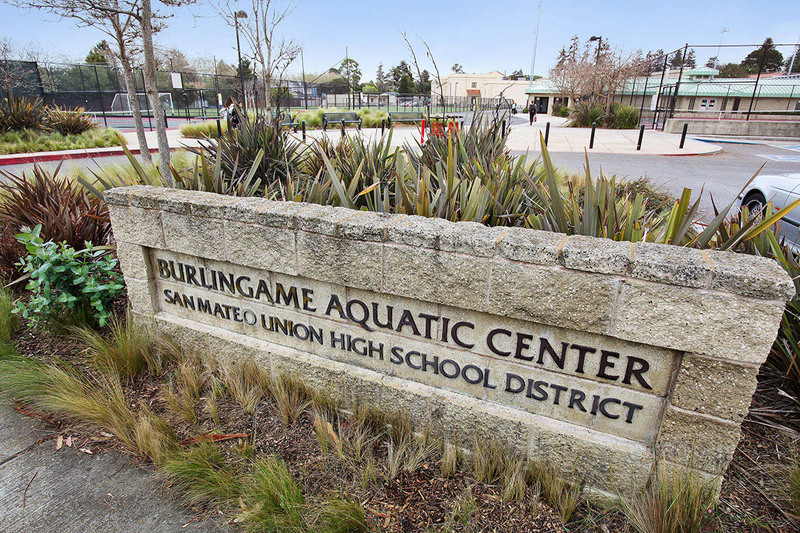 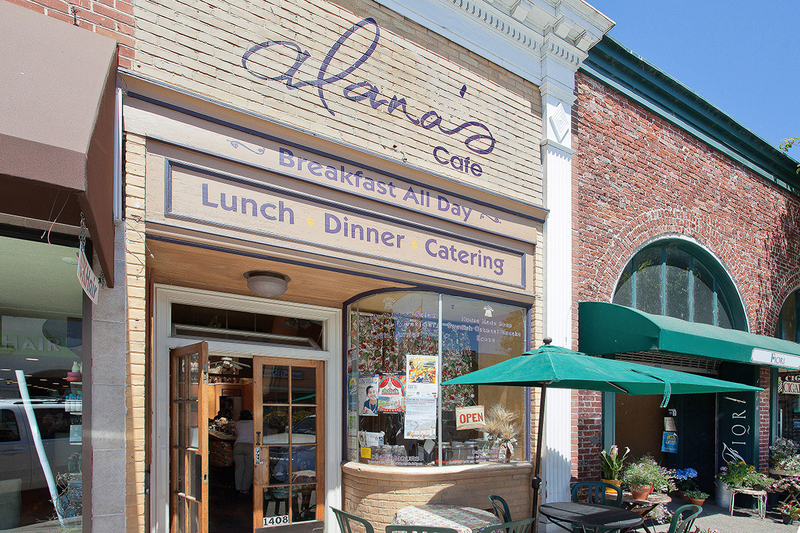 Located midway between Silicon Valley and San Francisco, major employers and vibrant downtown Burlingame. 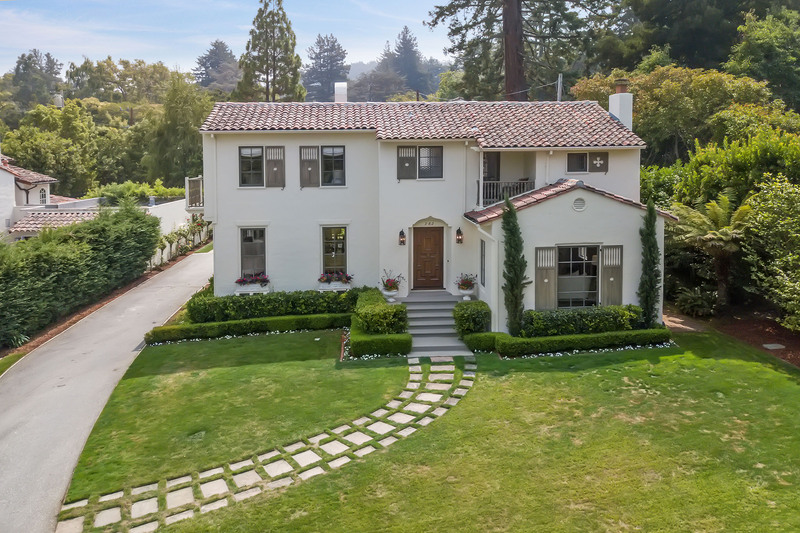 Extras: Nest thermostat, gated driveway, updated electrical and plumbing (buyer to verify), re-roofed with original clay tiles in 2015, NanaWall doors.